A genetically modified organism (GMO) is any organism whose genetic material has been altered using genetic engineering techniques. The exact definition of a genetically modified organism and what constitutes genetic engineering varies, with the most common being an organism altered in a way that "does not occur naturally by mating and/or natural recombination". A wide variety of organisms have been genetically modified (GM), from animals to plants and microorganisms. Genes have been transferred within the same species, across species (creating transgenic organisms) and even across kingdoms. New genes can be introduced, or endogenous genes can be enhanced, altered or knocked out. Creating a genetically modified organism is a multi-step process. Genetic engineers must isolate the gene they wish to insert into the host organism and combine it with other genetic elements, including a promoter and terminator region and often a selectable marker. A number of techniques are available for inserting the isolated gene into the host genome. Recent advancements using genome editing techniques, notably CRISPR, have made the production of GMO's much simpler. Herbert Boyer and Stanley Cohen made the first genetically modified organism in 1973, a bacteria resistant to the antibiotic kanamycin. The first genetically modified animal, a mouse, was created in 1974 by Rudolf Jaenisch, and the first plant was produced in 1983. In 1994 the Flavr Savr tomato was released, the first commercialized genetically modified food. The first genetically modified animal to be commercialized was the GloFish (2003) and the first genetically modified animal to be approved for food use was the AquAdvantage salmon in 2015. 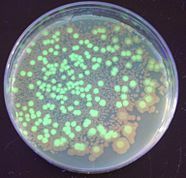 Bacteria are the easiest organisms to engineer and have been used for research, food production, industrial protein purification (including drugs), agriculture, and art. There is potential to use them for environmental, purposes or as medicine. Fungi have been engineered with much the same goals. Viruses play an important role as vectors for inserting genetic information into other organisms. This use is especially relevant to human gene therapy. There are proposals to remove the virulent genes from viruses to create vaccines. Plants have been engineered for scientific research, to create new colors in plants, deliver vaccines and to create enhanced crops. Genetically modified crops are publicly the most controversial GMOs. The majority are engineered for herbicide tolerance or insect resistance. Golden rice has been engineered with three genes that increase its nutritional value. Other prospects for GM crops are as bioreactors for the production of biopharmaceuticals, biofuels or medicines. Animals are generally much harder to transform and the vast majority are still at the research stage. Mammals are the best model organisms for humans, making ones genetically engineered to resemble serious human diseases important to the discovery and development of treatments. Human proteins expressed in mammals are more likely to be similar to their natural counterparts than those expressed in plants or microorganisms. Livestock are modified with the intention of improving economically important traits such as growth-rate, quality of meat, milk composition, disease resistance and survival. Genetically modified fish are used for scientific research, as pets and as a food source. Genetic engineering has been proposed as a way to control mosquitos, a vector for many deadly diseases. Although human gene therapy is still relatively new, it has been used to treat genetic disorders such as severe combined immunodeficiency, and Leber's congenital amaurosis. A narrower definition provided by the Food and Agriculture Organization, the World Health Organization and the European Commission says that the organisms must be altered in a way that does "not occur naturally by mating and/or natural recombination". There are examples of crops that fit this definition, but are not normally considered GMOs. For example, the grain crop triticale was fully developed in a laboratory in 1930 using various techniques to alter its genome. The Cartagena Protocol on Biosafety in 2000 used the synonym living modified organism (LMO) and defined it as "any living organism that possesses a novel combination of genetic material obtained through the use of modern biotechnology." Modern biotechnology is further defined as "In vitro nucleic acid techniques, including recombinant deoxyribonucleic acid (DNA) and direct injection of nucleic acid into cells or organelles, or fusion of cells beyond the taxonomic family." Genetically engineered organism (GEO) can be considered a more precise term compared to GMO when describing organisms' genomes that have been directly manipulated with biotechnology. The term GMO originally was not typically used by scientists to describe genetically engineered organisms until after usage of GMO became common in popular media. The United States Department of Agriculture (USDA) considers GMOs to be plants or animals with heritable changes introduced by genetic engineering or traditional methods, while GEO specifically refers to organisms with genes introduced, eliminated, or rearranged using molecular biology, particularly recombinant DNA techniques, such as transgenesis. The definitions focus on the process more than the product, which means there could be GMOS and non-GMOs with very similar genotypes and phenotypes. This has led scientists to label it as a scientifically meaningless category, saying that it is impossible to group all the different types of GMOs under one common definition. It has also caused issues for organic institutions and groups looking to ban GMOs. It also poses problems as new processes are developed. The current definitions came in before genome editing became popular and there is some confusion as to whether they are GMOs. The EU has adjudged that they are changing their GMO definition to include "organisms obtained by mutagenesis". In contrast the USDA has ruled that gene edited organisms are not considered GMOs. A gene gun uses biolistics to insert DNA into plant tissue. Creating a genetically modified organism (GMO) is a multi-step process. Genetic engineers must isolate the gene they wish to insert into the host organism. This gene can be taken from a cell or artificially synthesized. If the chosen gene or the donor organism's genome has been well studied it may already be accessible from a genetic library. The gene is then combined with other genetic elements, including a promoter and terminator region and a selectable marker. A number of techniques are available for inserting the isolated gene into the host genome. Bacteria can be induced to take up foreign DNA, usually by exposed heat shock or electroporation. DNA is generally inserted into animal cells using microinjection, where it can be injected through the cell's nuclear envelope directly into the nucleus, or through the use of viral vectors. In plants the DNA is often inserted using Agrobacterium-mediated recombination, biolistics or electroporation. As only a single cell is transformed with genetic material, the organism must be regenerated from that single cell. In plants this is accomplished through tissue culture. In animals it is necessary to ensure that the inserted DNA is present in the embryonic stem cells. Further testing using PCR, Southern hybridization, and DNA sequencing is conducted to confirm that an organism contains the new gene. Traditionally the new genetic material was inserted randomly within the host genome. Gene targeting techniques, which creates double-stranded breaks and takes advantage on the cells natural homologous recombination repair systems, have been developed to target insertion to exact locations. Genome editing uses artificially engineered nucleases that create breaks at specific points. There are four families of engineered nucleases: meganucleases, zinc finger nucleases, transcription activator-like effector nucleases (TALENs), and the Cas9-guideRNA system (adapted from CRISPR). TALEN and CRISPR are the two most commonly used and each has its own advantages. TALENs have greater target specificity, while CRISPR is easier to design and more efficient. Herbert Boyer (pictured) and Stanley Cohen created the first genetically modified organism in 1973. Humans have domesticated plants and animals since around 12,000 BCE, using selective breeding or artificial selection (as contrasted with natural selection). :25 The process of selective breeding, in which organisms with desired traits (and thus with the desired genes) are used to breed the next generation and organisms lacking the trait are not bred, is a precursor to the modern concept of genetic modification. :1:1 Various advancements in genetics allowed humans to directly alter the DNA and therefore genes of organisms. In 1972 Paul Berg created the first recombinant DNA molecule when he combined DNA from a monkey virus with that of the lambda virus. Herbert Boyer and Stanley Cohen made the first genetically modified organism in 1973. They took a gene from a bacterium that provided resistance to the antibiotic kanamycin, inserted it into a plasmid and then induced other bacteria to incorporate the plasmid. The bacteria that had successfully incorporated the plasmid was then able to survive in the presence of kanamycin. Boyer and Cohen expressed other genes in bacteria. This included genes from the toad Xenopus laevis in 1974, creating the first GMO expressing a gene from an organism of a different kingdom. In 1974 Rudolf Jaenisch created the first genetically modified animal. 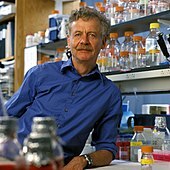 In 1974 Rudolf Jaenisch created a transgenic mouse by introducing foreign DNA into its embryo, making it the world's first transgenic animal. 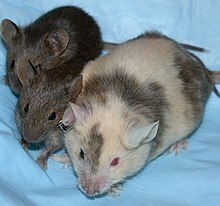 However it took another eight years before transgenic mice were developed that passed the transgene to their offspring. Genetically modified mice were created in 1984 that carried cloned oncogenes, predisposing them to developing cancer. Mice with genes removed (termed a knockout mouse) were created in 1989. The first transgenic livestock were produced in 1985 and the first animal to synthesize transgenic proteins in their milk were mice in 1987. The mice were engineered to produce human tissue plasminogen activator, a protein involved in breaking down blood clots. In 1983 the first genetically engineered plant was developed by Michael W. Bevan, Richard B. Flavell and Mary-Dell Chilton. 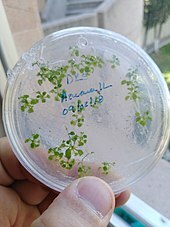 They infected tobacco with Agrobacterium transformed with an antibiotic resistance gene and through tissue culture techniques were able to grow a new plant containing the resistance gene. The gene gun was invented in 1987, allowing transformation of plants not susceptible to Agrobacterium infection. In 2000, Vitamin A-enriched golden rice was the first plant developed with increased nutrient value. In 1976 Genentech, the first genetic engineering company was founded by Herbert Boyer and Robert Swanson; a year later, the company produced a human protein (somatostatin) in E.coli. Genentech announced the production of genetically engineered human insulin in 1978. The insulin produced by bacteria, branded humulin, was approved for release by the Food and Drug Administration in 1982. In 1988 the first human antibodies were produced in plants. In 1987, a strain of Pseudomonas syringae became the first genetically modified organism to be released into the environment when a strawberry and potato field in California were sprayed with it. The first genetically modified crop, an antibiotic-resistant tobacco plant, was produced in 1982. China was the first country to commercialize transgenic plants, introducing a virus-resistant tobacco in 1992. In 1994 Calgene attained approval to commercially release the Flavr Savr tomato, the first genetically modified food. Also in 1994, the European Union approved tobacco engineered to be resistant to the herbicide bromoxynil, making it the first genetically engineered crop commercialized in Europe. An insect resistant Potato was approved for release in the US in 1995, and by 1996 approval had been granted to commercially grow 8 transgenic crops and one flower crop (carnation) in 6 countries plus the EU. In 2010, scientists at the J. Craig Venter Institute announced that they had created the first synthetic bacterial genome. They named it Synthia and it was the world's first synthetic life form. The first genetically modified animal to be commercialized was the GloFish, a Zebra fish with a fluorescent gene added that allows it to glow in the dark under ultraviolet light. It was released to the US market in 2003. In 2015 AquAdvantage salmon became the first genetically modified animal to be approved for food use. Approval is for fish raised in Panama and sold in the US. The salmon were transformed with a growth hormone-regulating gene from a Pacific Chinook salmon and a promoter from an ocean pout enabling it to grow year-round instead of only during spring and summer. Bacteria were the first organisms to be genetically modified in the laboratory, due to the relative ease of modifying their chromosomes. This ease made them important tools for the creation of other GMOs. Genes and other genetic information from a wide range of organisms can be added to a plasmid and inserted into bacteria for storage and modification. Bacteria are cheap, easy to grow, clonal, multiply quickly and can be stored at −80 °C almost indefinitely. Once a gene is isolated it can be stored inside the bacteria, providing an unlimited supply for research. A large number of custom plasmids make manipulating DNA extracted from bacteria relatively easy. Their ease of use has made them great tools for scientists looking to study gene function and evolution. The simplest model organisms come from bacteria, with most of our early understanding of molecular biology coming from studying Escherichia coli. Scientists can easily manipulate and combine genes within the bacteria to create novel or disrupted proteins and observe the effect this has on various molecular systems. Researchers have combined the genes from bacteria and archaea, leading to insights on how these two diverged in the past. In the field of synthetic biology, they have been used to test various synthetic approaches, from synthesising genomes to creating novel nucleotides. Bacteria have been used in the production of food for a long time, and specific strains have been developed and selected for that work on an industrial scale. They can be used to produce enzymes, amino acids, flavourings, and other compounds used in food production. With the advent of genetic engineering, new genetic changes can easily be introduced into these bacteria. Most food-producing bacteria are lactic acid bacteria, and this is where the majority of research into genetically engineering food-producing bacteria has gone. The bacteria can be modified to operate more efficiently, reduce toxic byproduct production, increase output, create improved compounds, and remove unnecessary pathways. Food products from genetically modified bacteria include alpha-amylase, which converts starch to simple sugars, chymosin, which clots milk protein for cheese making, and pectinesterase, which improves fruit juice clarity. The majority are produced in the US and even though regulations are in place to allow production in Europe, as of 2015 no food products derived from bacteria are currently available there. Genetically modified bacteria are used to produce large amounts of proteins for industrial use. Generally the bacteria are grown to a large volume before the gene encoding the protein is activated. The bacteria are then harvested and the desired protein purified from them. The high cost of extraction and purification has meant that only high value products have been produced at an industrial scale. The majority of these products are human proteins for use in medicine. Many of these proteins are impossible or difficult to obtain via natural methods and they are less likely to be contaminated with pathogens, making them safer. The first medicinal use of GM bacteria was to produce the protein insulin to treat diabetes. Other medicines produced include clotting factors to treat haemophilia, human growth hormone to treat various forms of dwarfism, interferon to treat some cancers, erythropoietin for anemic patients, and tissue plasminogen activator which dissolves blood clots. Outside of medicine they have been used to produce biofuels. There is interest in developing an extracellular expression system within the bacteria to reduce costs and make the production of more products economical. With greater understanding of the role that the microbiome plays in human health, there is the potential to treat diseases by genetically altering the bacteria to, themselves, be therapeutic agents. Ideas include altering gut bacteria so they destroy harmful bacteria, or using bacteria to replace or increase deficient enzymes or proteins. One research focus is to modify Lactobacillus, bacteria that naturally provide some protection against HIV, with genes that will further enhance this protection. If the bacteria do not form colonies inside the patient, the person must repeatedly ingest the modified bacteria in order to get the required doses. Enabling the bacteria to form a colony could provide a more long-term solution, but could also raise safety concerns as interactions between bacteria and the human body are less well understood than with traditional drugs. There are concerns that horizontal gene transfer to other bacteria could have unknown effects. As of 2018 there are clinical trials underway testing the efficacy and safety of these treatments. For over a century bacteria have been used in agriculture. Crops have been inoculated with Rhizobia (and more recently Azospirillum) to increase their production or to allow them to be grown outside their original habitat. Application of Bacillus thuringiensis (Bt) and other bacteria can help protect crops from insect infestation and plant diseases. With advances in genetic engineering, these bacteria have been manipulated for increased efficiency and expanded host range. Markers have also been added to aid in tracing the spread of the bacteria. The bacteria that naturally colonize certain crops have also been modified, in some cases to express the Bt genes responsible for pest resistance. Pseudomonas strains of bacteria cause frost damage by nucleating water into ice crystals around themselves. This led to the development of ice-minus bacteria, that have the ice-forming genes removed. When applied to crops they can compete with the non-modified bacteria and confer some frost resistance. This artwork is made with bacteria modified to express 8 different colors of fluorescent proteins. Other uses for genetically modified bacteria include bioremediation, where the bacteria are used to convert pollutants into a less toxic form. Genetic engineering can increase the levels of the enzymes used to degrade a toxin or to make the bacteria more stable under environmental conditions. Bioart has also been created using genetically modified bacteria. In the 1980s artist Jon Davis and geneticist Dana Boyd converted the Germanic symbol for femininity (ᛉ) into binary code and then into a DNA sequence, which was then expressed in Escherichia coli. This was taken a step further in 2012, when a whole book was encoded onto DNA. 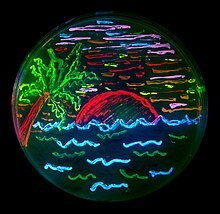 Paintings have also been produced using bacteria transformed with fluorescent proteins. Viruses are often modified so they can be used as vectors for inserting genetic information into other organisms. This process is called transduction and if successful the recipient of the introduced DNA becomes a GMO. Different viruses have different efficiencies and capabilities. Researchers can use this to control for various factors; including the target location, insert size and duration of gene expression. Any dangerous sequences inherent in the virus must be removed, while those that allow the gene to be delivered effectively are retained. While viral vectors can be used to insert DNA into almost any organism it is especially relevant for its potential in treating human disease. Although primarily still at trial stages, there has been some successes using gene therapy to replace defective genes. This is most evident in curing patients with severe combined immunodeficiency rising from adenosine deaminase deficiency (ADA-SCID), although the development of leukemia in some ADA-SCID patients along with the death of Jesse Gelsinger in a 1999 trial set back the development of this approach for many years. In 2009 another breakthrough was achieved when an eight-year-old boy with Leber's congenital amaurosis regained normal eyesight and in 2016 GlaxoSmithKline gained approval to commercialize a gene therapy treatment for ADA-SCID. As of 2018, there are a substantial number of clinical trials underway, including treatments for hemophilia, glioblastoma, chronic granulomatous disease, cystic fibrosis and various cancers. The most common virus used for gene delivery come from adenoviruses as they can carry up to 7.5 kb of foreign DNA and infect a relatively broad range of host cells, although they have been know to elicit immune responses in the host and only provide short term expression. Other common vectors are adeno-associated viruses, which have lower toxicity and longer term expression, but can only carry about 4kb of DNA. Herpes simplex viruses make promising vectors, having a carrying capacity of over 30kb and providing long term expression, although they are less efficient at gene delivery than other vectors. The best vectors for long term integration of the gene into the host genome are retroviruses, but their propensity for random integration is problematic. Lentiviruses are a part of the same family as retroviruses with the advantage of infecting both dividing and non-dividing cells, whereas retroviruses only target dividing cells. Other viruses that have been used as vectors include alphaviruses, flaviviruses, measles viruses, rhabdoviruses, Newcastle disease virus, poxviruses, and picornaviruses. Most vaccines consist of viruses that have been attenuated, disabled, weakened or killed in some way so that their virulent properties are no longer effective. Genetic engineering could theoretically be used to create viruses with the virulent genes removed. This does not affect the viruses infectivity, invokes a natural immune response and there is no chance that they will regain their virulence function, which can occur with some other vaccines. As such they are generally considered safer and more efficient than conventional vaccines, although concerns remain over non-target infection, potential side effects and horizontal gene transfer to other viruses. Another potential approach is to use vectors to create novel vaccines for diseases that have no vaccines available or the vaccines that do not work effectively, such as AIDS, malaria, and tuberculosis. The most effective vaccine against Tuberculosis, the Bacillus Calmette–Guérin (BCG) vaccine, only provides partial protection. A modified vaccine expressing a M tuberculosis antigen is able to enhance BCG protection. It has been shown to be safe to use at phase II trials, although not as effective as initially hoped. Other vector-based vaccines have already been approved and many more are being developed. Another potential use of genetically modified viruses is to alter them so they can directly treat diseases. This can be through expression of protective proteins or by directly targeting infected cells. In 2004, researchers reported that a genetically modified virus that exploits the selfish behaviour of cancer cells might offer an alternative way of killing tumours. Since then, several researchers have developed genetically modified oncolytic viruses that show promise as treatments for various types of cancer. In 2017 researchers genetically modified a virus to express spinach defensin proteins. The virus was injected into orange trees to combat citrus greening disease that had reduced orange production by 70% since 2005. Natural viral diseases, such as myxomatosis and rabbit haemorrhagic disease, have been used to help control pest populations. Over time the surviving pests become resistant, leading researchers to look at alternative methods. Genetically modified viruses that make the target animals infertile through immunocontraception have been created in the laboratory as well as others that target the developmental stage of the animal. There are concerns with using this approach regarding virus containment and cross species infection. Sometimes the same virus can be modified for contrasting purposes. Genetic modification of the myxoma virus has been proposed to conserve European wild rabbits in the Iberian peninsula and to help regulate them in Australia. To protect the Iberian species from viral diseases, the myxoma virus was genetically modified to immunize the rabbits, while in Australia the same myxoma virus was genetically modified to lower fertility in the Australian rabbit population. Outside of biology scientists have used a genetically modified virus to construct a lithium-ion battery and other nanostructured materials. It is possible to engineer bacteriophages to express modified proteins on their surface and join them up in specific patterns (a technique called phage display). These structures have potential uses for energy storage and generation, biosensing and tissue regeneration with some new materials currently produced including quantum dots, liquid crystals, nanorings and nanofibres. The battery was made by engineering M13 bacteriaophages so they would coat themselves in iron phosphate and then assemble themselves along a carbon nanotube. This created a highly conductive medium for use in a cathode, allowing energy to be transferred quickly. They could be constructed at lower temperatures with non-toxic chemicals, making them more environmentally friendly. Fungi can be used for many of the same processes as bacteria. For industrial applications, yeasts combines the bacterial advantages of being a single celled organism that is easy to manipulate and grow with the advanced protein modifications found in eukaryotes. They can be used to produce large complex molecules for use in food, pharmaceuticals, hormones and steroids. Yeast is important for wine production and as of 2016 two genetically modified yeasts involved in the fermentation of wine have been commercialized in the United States and Canada. One has increased malolactic fermentation efficiency, while the other prevents the production of dangerous ethyl carbamate compounds during fermentation. 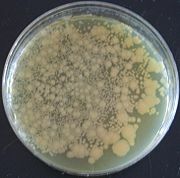 There have also been advances in the production of biofuel from genetically modified fungi. Fungi, being the most common pathogens of insects, make attractive biopesticides. Unlike bacteria and viruses they have the advantage of infecting the insects by contact alone, although they are out competed in efficiency by chemical pesticides. Genetic engineering can improve virulence, usually by adding more virulent proteins, increasing infection rate or enhancing spore persistence. Many of the disease carrying vectors are susceptible to entomopathogenic fungi. An attractive target for biological control are mosquitos, vectors for a range of deadly diseases, including malaria, yellow fever and dengue fever. Mosquitos can evolve quickly so it becomes a balancing act of killing them before the Plasmodium they carry becomes the infectious disease, but not so fast that they become resistant to the fungi. By genetically engineering fungi like Metarhizium anisopliae and Beauveria bassiana to delay the development of mosquito infectiousness the selection pressure to evolve resistance is reduced. Another strategy is to add proteins to the fungi that block transmission of malaria or remove the Plasmodium altogether. A mushroom has been gene edited to resist browning, giving it a longer shelf life. The process used CRISPR to knock out a gene that encodes polyphenol oxidase. As it didn't introduce any foreign DNA into the organism it was not deemed to be regulated under existing GMO frameworks and as such is the first CRISPR-edited organism to be approved for release. This has intensified debates as to whether gene-edited organisms should be considered genetically modified organisms and how they should be regulated. Plants have been engineered for scientific research, to display new flower colors, deliver vaccines and to create enhanced crops. Many plants are pluripotent, meaning that a single cell from a mature plant can be harvested and under the right conditions can develop into a new plant. This ability can be taken advantage of by genetic engineers; by selecting for cells that have been successfully transformed in an adult plant a new plant can then be grown that contains the transgene in every cell through a process known as tissue culture. Much of the advances in the field of genetic engineering has come from experimentation with tobacco. Major advances in tissue culture and plant cellular mechanisms for a wide range of plants has originated from systems developed in tobacco. It was the first plant to be altered using genetic engineering and is considered a model organism for not only genetic engineering, but a range of other fields. As such the transgenic tools and procedures are well established making tobacco one of the easiest plants to transform. Another major model organism relevant to genetic engineering is Arabidopsis thaliana. Its small genome and short life cycle makes it easy to manipulate and it contains many homologues to important crop species. It was the first plant sequenced, has a host of online resources available and can be transformed by simply dipping a flower in a transformed Agrobacterium solution. In research, plants are engineered to help discover the functions of certain genes. The simplest way to do this is to remove the gene and see what phenotype develops compared to the wild type form. Any differences are possibly the result of the missing gene. Unlike mutagenisis, genetic engineering allows targeted removal without disrupting other genes in the organism. Some genes are only expressed in certain tissue, so reporter genes, like GUS, can be attached to the gene of interest allowing visualization of the location. Other ways to test a gene is to alter it slightly and then return it to the plant and see if it still has the same effect on phenotype. Other strategies include attaching the gene to a strong promoter and see what happens when it is over expressed, forcing a gene to be expressed in a different location or at different developmental stages. Some genetically modified plants are purely ornamental. They are modified for flower color, fragrance, flower shape and plant architecture. The first genetically modified ornamentals commercialized altered color. 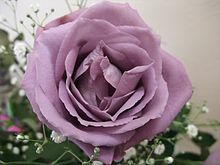 Carnations were released in 1997, with the most popular genetically modified organism, a blue rose (actually lavender or mauve) created in 2004. The roses are sold in Japan, the United States, and Canada. Other genetically modified ornamentals include Chrysanthemum and Petunia. As well as increasing aesthetic value there are plans to develop ornamentals that use less water or are resistant to the cold, which would allow them to be grown outside their natural environments. It has been proposed to genetically modify some plant species threatened by extinction to be resistant to invasive plants and diseases, such as the emerald ash borer in North American and the fungal disease, Ceratocystis platani, in European plane trees. The papaya ringspot virus devastated papaya trees in Hawaii in the twentieth century until transgenic papaya plants were given pathogen-derived resistance. However, genetic modification for conservation in plants remains mainly speculative. A unique concern is that a transgenic species may no longer bear enough resemblance to the original species to truly claim that the original species is being conserved. Instead, the transgenic species may be genetically different enough to be considered a new species, thus diminishing the conservation worth of genetic modification. 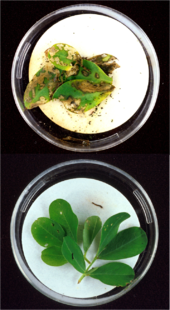 Wild type peanut (top) and transgenic peanut with Bacillus thuringiensis gene added (bottom) exposed to cornstalk borer larva. Genetically modified crops are genetically modified plants that are used in agriculture. The first crops developed were used for animal or human food and provide resistance to certain pests, diseases, environmental conditions, spoilage or chemical treatments (e.g. resistance to a herbicide). The second generation of crops aimed to improve the quality, often by altering the nutrient profile. Third generation genetically modified crops could be used for non-food purposes, including the production of pharmaceutical agents, biofuels, and other industrially useful goods, as well as for bioremediation. There are three main aims to agricultural advancement; increased production, improved conditions for agricultural workers and sustainability. GM crops contribute by improving harvests through reducing insect pressure, increasing nutrient value and tolerating different abiotic stresses. Despite this potential, as of 2018, the commercialized crops are limited mostly to cash crops like cotton, soybean, maize and canola and the vast majority of the introduced traits provide either herbicide tolerance or insect resistance. Soybeans accounted for half of all genetically modified crops planted in 2014. Adoption by farmers has been rapid, between 1996 and 2013, the total surface area of land cultivated with GM crops increased by a factor of 100. Geographically though the spread has been uneven, with strong growth in the Americas and parts of Asia and little in Europe and Africa. Its socioeconomic spread has been more even, with approximately 54% of worldwide GM crops grown in developing countries in 2013. Although doubts have been raised, most studies have found growing GM crops to be beneficial to farmers through decreased pesticide use as well as increased crop yield and farm profit. The majority of GM crops have been modified to be resistant to selected herbicides, usually a glyphosate or glufosinate based one. Genetically modified crops engineered to resist herbicides are now more available than conventionally bred resistant varieties; in the USA 93% of soybeans and most of the GM maize grown is glyphosate tolerant. Most currently available genes used to engineer insect resistance come from the Bacillus thuringiensis bacterium and code for delta endotoxins. A few use the genes that encode for vegetative insecticidal proteins. The only gene commercially used to provide insect protection that does not originate from B. thuringiensis is the Cowpea trypsin inhibitor (CpTI). CpTI was first approved for use cotton in 1999 and is currently undergoing trials in rice. Less than one percent of GM crops contained other traits, which include providing virus resistance, delaying senescence and altering the plants composition. Golden rice is the most well known GM crop that is aimed at increasing nutrient value. It has been engineered with three genes that biosynthesise beta-carotene, a precursor of vitamin A, in the edible parts of rice. It is intended to produce a fortified food to be grown and consumed in areas with a shortage of dietary vitamin A, a deficiency which each year is estimated to kill 670,000 children under the age of 5 and cause an additional 500,000 cases of irreversible childhood blindness. The original golden rice produced 1.6μg/g of the carotenoids, with further development increasing this 23 times. In 2018 it gained its first approvals for use as food. Plants and plant cells have been genetically engineered for production of biopharmaceuticals in bioreactors, a process known as pharming. Work has been done with duckweed Lemna minor, the algae Chlamydomonas reinhardtii and the moss Physcomitrella patens. Biopharmaceuticals produced include cytokines, hormones, antibodies, enzymes and vaccines, most of which are accumulated in the plant seeds. Many drugs also contain natural plant ingredients and the pathways that lead to their production have been genetically altered or transferred to other plant species to produce greater volume. Other options for bioreactors are biopolymers and biofuels. Unlike bacteria, plants can modify the proteins post-translationally, allowing them to make more complex molecules.They also pose less risk of being contaminated. Therapeutics have been cultured in transgenic carrot and tobacco cells, including a drug treatment for Gaucher's disease. Vaccine production and storage has great potential in transgenic plants. Vaccines are expensive to produce, transport and administer, so having a system that could produce them locally would allow greater access to poorer and developing areas. As well as purifying vaccines expressed in plants it is also possible to produce edible vaccines in plants. Edible vaccines stimulate the immune system when ingested to protect against certain diseases. Being stored in plants reduces the long-term cost as they can be disseminated without the need for cold storage, don't need to be purified and have long term stability. Also being housed within plant cells provides some protection from the gut acids upon digestion. However the cost of developing, regulating and containing transgenic plants is high, leading to most current plant-based vaccine development being applied to veterinary medicine, where the controls are not as strict. The vast majority of genetically modified animals are at the research stage with the number close to entering the market remaining small. As of 2018 only three genetically modified animals have been approved, all in the USA. A goat and a chicken have been engineered to produce medicines and a salmon that has increased growth. Despite the differences and difficulties in modifying them, the end aims are much the same as for plants. GM animals are created for research purposes, production of industrial or therapeutic products, agricultural uses or improving their health. There is also a market for creating genetically modified pets. The process of genetically engineering mammals is slow, tedious, and expensive. However, new technologies are making genetic modifications easier and more precise. The first transgenic mammals were produced by injecting viral DNA into embryos and then implanting the embryos in females. The embryo would develop and it would be hoped that some of the genetic material would be incorporated into the reproductive cells. Then researchers would have to wait until the animal reached breeding age and then offspring would be screened for presence of the gene in every cell. The development of the CRISPR-Cas9 gene editing system as a cheap and fast way of directly modifying germ cells, effectively halving the amount of time needed to develop genetically modified mammals. A porcine model of hemophilia A.
Mammals are the best models for human disease, making genetic engineered ones vital to the discovery and development of cures and treatments for many serious diseases. Knocking out genes responsible for human genetic disorders allows researchers to study the mechanism of the disease and to test possible cures. Genetically modified mice have been the most common mammals used in biomedical research, as they are cheap and easy to manipulate. Pigs are also a good target as they have a similar body size and anatomical features, physiology, pathophysiological response and diet. Nonhuman primates are the most similar model organisms to humans, but there is less public acceptance towards using them as research animals. In 2009, scientists announced that they had successfully transferred a gene into a primate species (marmosets) for the first time. Their first research target for these marmosets was Parkinson's disease, but they were also considering amyotrophic lateral sclerosis and Huntington's disease. Human proteins expressed in mammals are more likely to be similar to their natural counterparts than those expressed in plants or microorganisms. Stable expression has been accomplished in sheep, pigs, rats and other animals. In 2009 the first human biological drug produced from such an animal, a goat, was approved. The drug, ATryn, is an anticoagulant which reduces the probability of blood clots during surgery or childbirth and is extracted from the goat's milk. Human alpha-1-antitrypsin is another protein that has been produced from goats and is used in treating humans with this deficiency. Another medicinal area is in creating pigs with greater capacity for human organ transplants (xenotransplantation). Pigs have been genetically modified so that their organs can no longer carry retroviruses or have modifications to reduce the chance of rejection. Pig lungs from genetically modified pigs are being considered for transplantation into humans. There is even potential to create chimeric pigs that can carry human organs. Livestock are modified with the intention of improving economically important traits such as growth-rate, quality of meat, milk composition, disease resistance and survival. Animals have been engineered to grow faster, be healthier and resist diseases. Modifications have also improved the wool production of sheep and udder health of cows. Goats have been genetically engineered to produce milk with strong spiderweb-like silk proteins in their milk. A GM pig called Enviropig was created with the capability of digesting plant phosphorus more efficiently than conventional pigs. They could reduce water pollution since they excrete 30 to 70% less phosphorus in manure. Dairy cows have been genetically engineered to produce milk that would be the same as human breast milk. This could potentially benefit mothers who cannot produce breast milk but want their children to have breast milk rather than formula. Researchers have also developed a genetically engineered cow that produces allergy-free milk. 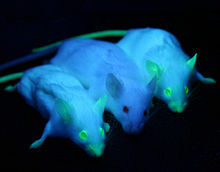 Scientists have genetically engineered several organisms, including some mammals, to include green fluorescent protein (GFP), for research purposes. GFP and other similar reporting genes allow easy visualization and localization of the products of the genetic modification. Fluorescent pigs have been bred to study human organ transplants, regenerating ocular photoreceptor cells, and other topics. In 2011 green-fluorescent cats were created to help find therapies for HIV/AIDS and other diseases as feline immunodeficiency virus is related to HIV. There have been suggestions that genetic engineering could be used to bring animals back from extinction. It involves changing the genome of a close living relative to resemble the extinct one and is currently being attempted with the passenger pigeon. Genes associated with the woolly mammoth have been added to the genome of an African Elephant, although the lead researcher says he has no intention of creating live elephants and transferring all the genes and reversing years of genetic evolution is a long way from being feasible. It is more likely that scientists could use this technology to conserve endangered animals by bringing back lost diversity or transferring evolved genetic advantages from adapted organisms to those that are struggling. Gene therapy uses genetically modified viruses to deliver genes which can cure disease in humans. Although gene therapy is still relatively new, it has had some successes. It has been used to treat genetic disorders such as severe combined immunodeficiency, and Leber's congenital amaurosis. Treatments are also being developed for a range of other currently incurable diseases, such as cystic fibrosis, sickle cell anemia, Parkinson's disease, cancer, diabetes, heart disease and muscular dystrophy. These treatments only effect somatic cells, meaning any changes would not be inheritable. Germline gene therapy results in any change being inheritable, which has raised concerns within the scientific community. In 2015, CRISPR was used to edit the DNA of non-viable human embryos. In November 2018, He Jiankui announced that he had edited the genomes of two human embryos, in an attempt to disable the CCR5 gene, which codes for a receptor that HIV uses to enter cells. He said that twin girls, Lulu and Nana, had been born a few weeks earlier and that they carried functional copies of CCR5 along with disabled CCR5 (mosaicism) and were still vulnerable to HIV. The work was widely condemned as unethical, dangerous, and premature. When exposed to 13°C water the zebrafish modified to express a carp creatine kinase (right) maintained swimming behaviour, while wild type zebrafish (left) could not. Genetically modified fish are used for scientific research, as pets and as a food source. Aquaculture is a growing industry, currently providing over half the consumed fish worldwide. Through genetic engineering it is possible to increase growth rates, reduce food intake, remove allergenic properties, increase cold tolerance and provide disease resistance. Fish can also be used to detect aquatic pollution or function as bioreactors. Several groups have been developing zebrafish to detect pollution by attaching fluorescent proteins to genes activated by the presence of pollutants. The fish will then glow and can be used as environmental sensors. The GloFish is a brand of genetically modified fluorescent zebrafish with bright red, green, and orange fluorescent color. It was originally developed by one of the groups to detect pollution, but is now part of the ornamental fish trade, becoming the first genetically modified animal to become publicly available as a pet when in 2003 it was introduced for sale in the USA. GM fish are widely used in basic research in genetics and development. Two species of fish, zebrafish and medaka, are most commonly modified because they have optically clear chorions (membranes in the egg), rapidly develop, and the one-cell embryo is easy to see and microinject with transgenic DNA. Zebrafish are model organisms for developmental processes, regeneration, genetics, behaviour, disease mechanisms and toxicity testing. Their transparency allows researchers to observe developmental stages, intestinal functions and tumour growth. The generation of transgenic protocols (whole organism, cell or tissue specific, tagged with reporter genes) has increased the level of information gained by studying these fish. GM fish have been developed with promoters driving an over-production of growth hormone for use in the aquaculture industry to increase the speed of development and potentially reduce fishing pressure on wild stocks. This has resulted in dramatic growth enhancement in several species, including salmon, trout and tilapia. AquaBounty Technologies, a biotechnology company, have produced a salmon (called AquAdvantage salmon) that can mature in half the time as wild salmon. It obtained regulatory approval in 2015, the first non-plant GMO food to be commercialized. As of August 2017, GMO salmon is being sold in Canada. Sales in the US are expected to start in the second half of 2019. Overexpression of methyl-CpG–binding protein 2 in Drosophila impairs climbing ability (right) compared to the control group (left). In biological research, transgenic fruit flies (Drosophila melanogaster) are model organisms used to study the effects of genetic changes on development. Fruit flies are often preferred over other animals due to their short life cycle and low maintenance requirements. They also have a relatively simple genome compared to many vertebrates, with typically only one copy of each gene, making phenotypic analysis easy. Drosophila have been used to study genetics and inheritance, embryonic development, learning, behavior, and aging. The discovery of transposons, in particular the p-element, in Drosophila provided an early method to add transgenes to their genome, although this has been taken over by more modern gene-editing techniques. Due to their significance to human health, scientists are looking at ways to control mosquitoes through genetic engineering. Malaria-resistant mosquitoes have been developed in the laboratory by inserting a gene that reduces the development of the malaria parasite and then use homing endonucleases to rapidly spread that gene throughout the male population (known as a gene drive). This approach has been taken further by using the gene drive to spread a lethal gene. In trials the populations of Aedes aegypti mosquitoes, the single most important carrier of dengue fever and Zika virus, were reduced by between 80% and by 90%. Another approach is to use a sterile insect technique, whereby males genetically engineered to be sterile out compete viable males, to reduce population numbers. Other insect pests that make attractive targets are moths. Diamondback moths cause US$4 to $5 billion of damage each year worldwide. 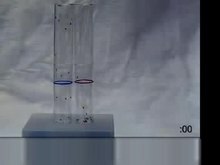 The approach is similar to the sterile technique tested on mosquitoes, where males are transformed with a gene that prevents any females born from reaching maturity. They underwent field trials in 2017. Genetically modified moths have previously been released in field trials. In this case a strain of pink bollworm that were sterilized with radiation were genetically engineered to express a red fluorescent protein making it easier for researchers to monitor them. Silkworm, the larvae stage of Bombyx mori, is an economically important insect in sericulture. Scientists are developing strategies to enhance silk quality and quantity. There is also potential to use the silk producing machinery to make other valuable proteins. Proteins currently developed to be expressed by silkworms include; human serum albumin, human collagen α-chain, mouse monoclonal antibody and N-glycanase. Silkworms have been created that produce spider silk, a stronger but extremely difficult to harvest silk, and even novel silks. Systems have been developed to create transgenic organisms in a wide variety of other animals. Chickens have been genetically modified for a variety of purposes. This includes studying embryo development, preventing the transmission of bird flu and providing evolutionary insights using reverse engineering to recreate dinosaur-like phenotypes. A GM chicken that produces the drug Kanuma, an enzyme that treats a rare condition, in its egg passed US regulatory approval in 2015. Genetically modified frogs, in particular Xenopus laevis and Xenopus tropicalis, are used in developmental biology research. GM frogs can also be used as pollution sensors, especially for endocrine disrupting chemicals. There are proposals to use genetic engineering to control cane toads in Australia. The nematode Caenorhabditis elegans is one of the major model organisms for researching molecular biology. RNA interference (RNAi) was discovered in C. elegans and could be induced by simply feeding them bacteria modified to express double stranded RNA. It is also relatively easy to produce stable transgenic nematodes and this along with RNAi are the major tools used in studying their genes. The most common use of transgenic nematodes has been studying gene expression and localization by attaching reporter genes. Transgenes can also be combined with RNAi techniques to rescue phenotypes, study gene function, image cell development in real time or control expression for different tissues or developmental stages. Transgenic nematodes have been used to study viruses, toxicology, diseases, and to detect environmental pollutants. The gene responsible for albinism in sea cucumbers has been found and used to engineer white sea cucumbers, a rare delicacy. The technology also opens the way to investigate the genes responsible for some of the cucumbers more unusual traits, including hibernating in summer, eviscerating their intestines, and dissolving their bodies upon death. Flatworms have the ability to regenerate themselves from a single cell. Until 2017 there was no effective way to transform them, which hampered research. By using microinjection and radiation scientists have now created the first genetically modified flatworms. The bristle worm, a marine annelid, has been modified. It is of interest due to its reproductive cycle being synchronized with lunar phases, regeneration capacity and slow evolution rate. Cnidaria such as Hydra and the sea anemone Nematostella vectensis are attractive model organisms to study the evolution of immunity and certain developmental processes. Other animals that have been genetically modified include snails, geckos, turtles, crayfish, oysters, shrimp, clams, abalone and sponges. Genetically modified organisms are regulated by government agencies. This applies to research as well as the release of genetically modified organisms, including crops and food. The development of a regulatory framework concerning genetic engineering began in 1975, at Asilomar, California. The Asilomar meeting recommended a set of guidelines regarding the cautious use of recombinant technology and any products resulting from that technology. The Cartagena Protocol on Biosafety was adopted on 29 January 2000 and entered into force on 11 September 2003. It is an international treaty that governs the transfer, handling, and use of genetically modified organisms. One hundred and fifty-seven countries are members of the Protocol and many use it as a reference point for their own regulations. Universities and research institutes generally have a special committee that is responsible for approving any experiments that involve genetic engineering. Many experiments also need permission from a national regulatory group or legislation. All staff must be trained in the use of GMOs and all laboratories must gain approval from their regulatory agency to work with GMOs. The legislation covering GMOs are often derived from regulations and guidelines in place for the non-GMO version of the organism, although they are more severe. There is a near universal system for assessing the relative risks associated with GMOs and other agents to laboratory staff and the community. They are assigned to one of four risk categories based on their virulence, the severity of disease, the mode of transmission, and the availability of preventive measures or treatments. There are four biosafety levels that a laboratory can fall into, ranging from level 1 (which is suitable for working with agents not associated with disease) to level 4 (working with life-threatening agents). Different countries use different nomenclature to describe the levels and can have different requirements for what can be done at each level. There are differences in the regulation for the release of GMOs between countries, with some of the most marked differences occurring between the US and Europe. Regulation varies in a given country depending on the intended use of the products of the genetic engineering. For example, a crop not intended for food use is generally not reviewed by authorities responsible for food safety. Some nations have banned the release of GMOs or restricted their use, and others permit them with widely differing degrees of regulation. In 2016 thirty eight countries officially ban or prohibit the cultivation of GMOs and nine (Algeria, Bhutan, Kenya, Kyrgyzstan, Madagascar, Peru, Russia, Venezuela and Zimbabwe) ban their importation. Most countries that do not allow GMO cultivation do permit research using GMOs. The European Union (EU) differentiates between approval for cultivation within the EU and approval for import and processing. While only a few GMOs have been approved for cultivation in the EU a number of GMOs have been approved for import and processing. The cultivation of GMOs has triggered a debate about the market for GMOs in Europe. Depending on the coexistence regulations, incentives for cultivation of GM crops differ. The US policy does not focus on the process as much as other countries, looks at verifiable scientific risks and uses the concept of substantial equivalence. Whether gene edited organisms should be regulated the same as genetically modified organism is debated. USA regulations sees them as separate and does not regulate them under the same conditions, while in Europe a GMO is any organism created using genetic engineering techniques. One of the key issues concerning regulators is whether GM products should be labeled. The European Commission says that mandatory labeling and traceability are needed to allow for informed choice, avoid potential false advertising and facilitate the withdrawal of products if adverse effects on health or the environment are discovered. The American Medical Association and the American Association for the Advancement of Science say that absent scientific evidence of harm even voluntary labeling is misleading and will falsely alarm consumers. Labeling of GMO products in the marketplace is required in 64 countries. Labeling can be mandatory up to a threshold GM content level (which varies between countries) or voluntary. In Canada and the US labeling of GM food is voluntary, while in Europe all food (including processed food) or feed which contains greater than 0.9% of approved GMOs must be labelled. In 2014, sales of products that had been labeled as non-GMO grew 30 percent to $1.1 billion. There is controversy over GMOs, especially with regard to their release outside laboratory environments. The dispute involves consumers, producers, biotechnology companies, governmental regulators, nongovernmental organizations, and scientists. Many of these concerns involve GM crops and whether food produced from them is safe and what impact growing them will have on the environment. These controversies have led to litigation, international trade disputes, and protests, and to restrictive regulation of commercial products in some countries. Most concerns are around the health and environmental effects of GMOs. These include whether they may provoke an allergic reaction, whether the transgenes could transfer to human cells and whether genes not approved for human consumption could outcross into the food supply. Before food is released it is tested for animal toxicity and allergenicity. Gene flow between GM crops and compatible plants, along with increased use of broad-spectrum herbicides, can increase the risk of herbicide resistant weed populations. Debate over the extent and consequences of gene flow intensified in 2001 when a paper was published showing transgenes had been found in landrace maize in Mexico, the crops center of diversity. Gene flow from GM crops to other organisms has been found to generally be lower than what would occur naturally. In order to address some of these concerns some GMOs have been developed with traits to help control their spread. To prevent the genetically modified salmon inadvertently breeding with wild salmon, all the fish raised for food are females, triploid, 99% are reproductively sterile, and raised in areas where escaped salmon could not survive. Bacteria have also been modified to depend on nutrients that cannot be found in nature, and genetic use restriction technology has been developed, though not yet marketed, that causes the second generation of GM plants to be sterile. Other environmental and agronomic concerns include a decrease in biodiversity, an increase in secondary pests (non-targeted pests) and evolution of resistant insect pests. In the areas of China and the US with Bt crops the overall biodiversity of insects has increased and the impact of secondary pests has been minimal. Resistance was found to be slow to evolve when best practice strategies were followed. The impact of Bt crops on beneficial non-target organisms became a public issue after a 1999 paper suggested they could be toxic to monarch butterflies. Follow up studies have since shown that the toxicity levels encountered in the field were not high enough to harm the larvae. Accusations that scientists are "playing God" and other religious issues have been ascribed to the technology from the beginning. With the ability to genetically engineer humans now possible there are ethical concerns over how far this technology should go, or if it should be used at all. Much debate revolves around where the line between treatment and enhancement is and whether the modifications should be inheritable. Other concerns include contamination of the non-genetically modified food supply, the rigor of the regulatory process, consolidation of control of the food supply in companies that make and sell GMOs, exaggeration of the benefits of genetic modification, or concerns over the use of herbicides with glyphosate. Other issues raised include the patenting of life and the use of intellectual property rights. There are large differences in consumer acceptance of GMOs, with Europeans more likely to view GM food negatively than North Americans. GMOs arrived on the scene as the public confidence in food safety, attributed to recent food scares such as Bovine spongiform encephalopathy and other scandals involving government regulation of products in Europe, was low. This along with campaigns run by various non-governmental organizations (NGO) have been very successful in blocking or limiting the use of GM crops. NGOs like the Organic Consumers Association, the Union of Concerned Scientists, Greenpeace and other groups have said that risks have not been adequately identified and managed and that there are unanswered questions regarding the potential long-term impact on human health from food derived from GMOs. They propose mandatory labeling or a moratorium on such products. ^ Chilton M (4 October 2016). "Nature, The First Creator Of GMOs". Forbes. Retrieved 4 January 2019. ^ Blakemore, Erin. "The First GMO Is 8,000 Years Old". Smithsonian. Retrieved 5 January 2019. ^ The European Parliament and the council of the European Union (12 March 2001). "Directive on the release of genetically modified organisms (GMOs) Directive 2001/18/EC ANNEX I A". Official Journal of the European Communities. ^ "Section 2: DESCRIPTION AND DEFINITIONS". www.fao.org. Retrieved 3 January 2019. ^ "WHO | Frequently asked questions on genetically modified foods". WHO. Retrieved 3 January 2019. ^ "The EU Legislation on GMOs - An Overview - EU Science Hub - European Commission". EU Science Hub. 29 June 2010. Retrieved 3 January 2019. ^ "Genetically modified foods: A critical review of their promise and problems". Food Science and Human Wellness. 5 (3): 116–123. 1 September 2016. doi:10.1016/j.fshw.2016.04.002. ISSN 2213-4530. ^ Oliver MJ (2014). "Why we need GMO crops in agriculture". Missouri Medicine. 111 (6): 492–507. PMC 6173531. PMID 25665234. ^ Secretariat of the Convention on Biological Diversity. Montreal: 2000. The Cartagena Protocol on Biosafety to the Convention on Biological Diversity. ^ "Frequently Asked Questions (FAQs) on the Cartagena Protocol". The Biosafety Clearing-House (BCH). 29 February 2012. Retrieved 3 January 2019. ^ Center for Food Safety and Applied Nutrition. "Food from Genetically Engineered Plants - Consumer Info About Food from Genetically Engineered Plants". www.fda.gov. Retrieved 8 January 2019. ^ "What Is the Difference Between Genetically Modified Organisms and Genetically Engineered Organisms?". agbiotech.ces.ncsu.edu. Retrieved 8 January 2019. ^ "Agricultural Biotechnology Glossary | USDA". www.usda.gov. Retrieved 8 January 2019. ^ Colombo L (2007). "The semantics of the term "genetically modified organism" // Genetic impact of aquaculture activities on native populations". Genimpact final scientific report (E U contract n. RICA-CT -2005-022802): 123–125. ^ Chassy BM (2007). "The History and Future of GMOs in Food and Agriculture". Cereal Foods World. doi:10.1094/cfw-52-4-0169. ISSN 0146-6283. ^ "Why the term GMO is 'scientifically meaningless'". Public Radio International. Retrieved 5 January 2019. ^ Tagliabue G (8 September 2015). "The nonsensical GMO pseudo-category and a precautionary rabbit hole". Nature Biotechnology. Retrieved 4 January 2019. ^ "National Organic Standards Board Materials/GMO Subcommittee Second Discussion Document on Excluded Methods Terminology" (PDF). United States Department of Agriculture. 22 August 2014. Retrieved 4 January 2019. ^ "Here's Why You Should Vote Against Measure P, Even If You Hate GMOs". Lost Coast Outpost. Retrieved 4 January 2019. ^ Neslen, Arthur (25 July 2018). "Gene-edited plants and animals are GM foods, EU court rules". The Guardian. ISSN 0261-3077. Retrieved 5 January 2019. ^ "Organisms obtained by mutagenesis are GMOs and are, in principle, subject to the obligations laid down by the GMO Directive" (PDF). curia.europa.eu. Retrieved 5 January 2019. ^ a b "A CRISPR definition of genetic modification". Nature Plants. 4 (5): 233. May 2018. doi:10.1038/s41477-018-0158-1. PMID 29725105. ^ Nicholl DS (29 May 2008). An Introduction to Genetic Engineering. Cambridge University Press. p. 34. ISBN 9781139471787. ^ Rahimzadeh M, Sadeghizadeh M, Najafi F, Arab S, Mobasheri H (December 2016). "Impact of heat shock step on bacterial transformation efficiency". Molecular Biology Research Communications. 5 (4): 257–261. PMC 5326489. PMID 28261629. ^ a b National Research Council (US) Committee on Identifying and Assessing Unintended Effects of Genetically Engineered Foods on Human Health (1 January 2004). Methods and Mechanisms for Genetic Manipulation of Plants, Animals, and Microorganisms. National Academies Press (US). ^ Head G, Hull RH, Tzotzos GT (2009). Genetically Modified Plants: Assessing Safety and Managing Risk. London: Academic Pr. p. 244. ISBN 978-0-12-374106-6. ^ Narayanaswamy S (1994). Plant Cell and Tissue Culture. Tata McGraw-Hill Education. pp. vi. ISBN 9780074602775. ^ Setlow JK (31 October 2002). Genetic Engineering: Principles and Methods. Springer Science & Business Media. p. 109. ISBN 9780306472800. ^ Tan WS, Carlson DF, Walton MW, Fahrenkrug SC, Hackett PB (2012). "Precision editing of large animal genomes". Advances in Genetics. Advances in Genetics. 80: 37–97. doi:10.1016/B978-0-12-404742-6.00002-8. ISBN 9780124047426. PMC 3683964. PMID 23084873. ^ a b Malzahn A, Lowder L, Qi Y (24 April 2017). "Plant genome editing with TALEN and CRISPR". Cell & Bioscience. 7: 21. doi:10.1186/s13578-017-0148-4. PMC 5404292. PMID 28451378. ^ Clive Root (2007). Domestication. Greenwood Publishing Groups. ^ Sateesh MK (25 August 2008). Bioethics And Biosafety. I. K. International Pvt Ltd. pp. 456–. ISBN 978-81-906757-0-3. Retrieved 27 March 2013. ^ Zhang C, Wohlhueter R, Zhang H (2016). "Genetically modified foods: A critical review of their promise and problems". Food Science and Human Wellness. 5 (3): 116–123. doi:10.1016/j.fshw.2016.04.002. ^ Russo, Eugene (2003). "Special Report: The birth of biotechnology". Nature. 421 (6921): 456–457. doi:10.1038/nj6921-456a. ISSN 0028-0836. ^ Morrow JF, Cohen SN, Chang AC, Boyer HW, Goodman HM, Helling RB (May 1974). "Replication and transcription of eukaryotic DNA in Escherichia coli". Proceedings of the National Academy of Sciences of the United States of America. 71 (5): 1743–7. Bibcode:1974PNAS...71.1743M. doi:10.1073/pnas.71.5.1743. PMC 388315. PMID 4600264. ^ "'Any idiot can do it.' Genome editor CRISPR could put mutant mice in everyone's reach". Science | AAAS. 2 November 2016. Retrieved 2 December 2016. ^ Gordon JW, Ruddle FH (December 1981). "Integration and stable germ line transmission of genes injected into mouse pronuclei". Science. 214 (4526): 1244–6. 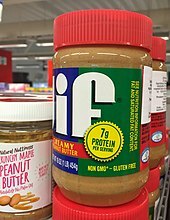 Bibcode:1981Sci...214.1244G. doi:10.1126/science.6272397. PMID 6272397. ^ Costantini F, Lacy E (November 1981). "Introduction of a rabbit beta-globin gene into the mouse germ line". Nature. 294 (5836): 92–4. Bibcode:1981Natur.294...92C. doi:10.1038/294092a0. PMID 6945481. ^ Hanahan D, Wagner EF, Palmiter RD (September 2007). "The origins of oncomice: a history of the first transgenic mice genetically engineered to develop cancer". Genes & Development. 21 (18): 2258–70. doi:10.1101/gad.1583307. PMID 17875663. ^ Brophy B, Smolenski G, Wheeler T, Wells D, L'Huillier P, Laible G (February 2003). "Cloned transgenic cattle produce milk with higher levels of beta-casein and kappa-casein". Nature Biotechnology. 21 (2): 157–62. doi:10.1038/nbt783. PMID 12548290. ^ Clark AJ (July 1998). "The mammary gland as a bioreactor: expression, processing, and production of recombinant proteins". Journal of Mammary Gland Biology and Neoplasia. 3 (3): 337–50. doi:10.1023/a:1018723712996. PMID 10819519. ^ Gordon K, Lee E, Vitale JA, Smith AE, Westphal H, Hennighausen L (1987). "Production of human tissue plasminogen activator in transgenic mouse milk. 1987". Biotechnology. 24 (11): 425–8. doi:10.1038/nbt1187-1183. PMID 1422049. ^ Bevan MW, Flavell RB, Chilton MD (1983). "A chimaeric antibiotic resistance gene as a selectable marker for plant cell transformation. 1983". Biotechnology. 24 (5922): 367–70. Bibcode:1983Natur.304..184B. doi:10.1038/304184a0. PMID 1422041. ^ a b Ye X, Al-Babili S, Klöti A, Zhang J, Lucca P, Beyer P, Potrykus I (January 2000). "Engineering the provitamin A (beta-carotene) biosynthetic pathway into (carotenoid-free) rice endosperm". Science. 287 (5451): 303–5. Bibcode:2000Sci...287..303Y. doi:10.1126/science.287.5451.303. PMID 10634784. ^ Goeddel DV, Kleid DG, Bolivar F, Heyneker HL, Yansura DG, Crea R, Hirose T, Kraszewski A, Itakura K, Riggs AD (January 1979). "Expression in Escherichia coli of chemically synthesized genes for human insulin". Proceedings of the National Academy of Sciences of the United States of America. 76 (1): 106–10. Bibcode:1979PNAS...76..106G. doi:10.1073/pnas.76.1.106. PMC 382885. PMID 85300. ^ Horn ME, Woodard SL, Howard JA (May 2004). "Plant molecular farming: systems and products". Plant Cell Reports. 22 (10): 711–20. doi:10.1007/s00299-004-0767-1. PMID 14997337. ^ BBC News 14 June 2002 GM crops: A bitter harvest? ^ Fraley RT, Rogers SG, Horsch RB, Sanders PR, Flick JS, Adams SP, Bittner ML, Brand LA, Fink CL, Fry JS, Galluppi GR, Goldberg SB, Hoffmann NL, Woo SC (August 1983). "Expression of bacterial genes in plant cells" (PDF). Proceedings of the National Academy of Sciences of the United States of America. 80 (15): 4803–7. Bibcode:1983PNAS...80.4803F. doi:10.1073/pnas.80.15.4803. PMC 384133. PMID 6308651. ^ James, Clive (1997). "Global Status of Transgenic Crops in 1997" (PDF). ISAAA Briefs No. 5.: 31. ^ Debora MacKenzie (18 June 1994). "Transgenic tobacco is European first". New Scientist. ^ Sample I (20 May 2010). "Craig Venter creates synthetic life form". London: guardian.co.uk. ^ Vàzquez-Salat N, Salter B, Smets G, Houdebine LM (1 November 2012). "The current state of GMO governance: are we ready for GM animals?". Biotechnology Advances. Special issue on ACB 2011. 30 (6): 1336–43. doi:10.1016/j.biotechadv.2012.02.006. PMID 22361646. ^ "Glowing fish to be first genetically changed pet". CNN. 21 November 2003. Retrieved 25 December 2018. ^ a b Pollack, Andrew (19 November 2015). "Genetically Engineered Salmon Approved for Consumption". The New York Times. ISSN 0362-4331. Retrieved 27 January 2019. ^ Bodnar, Anastasia (October 2010). "Risk Assessment and Mitigation of AquAdvantage Salmon" (PDF). ISB News Report. ^ Melo EO, Canavessi AM, Franco MM, Rumpf R (2007). "Animal transgenesis: state of the art and applications" (PDF). Journal of Applied Genetics. 48 (1): 47–61. doi:10.1007/BF03194657. PMID 17272861. Archived from the original (PDF) on 27 September 2009. ^ "Rediscovering Biology - Online Textbook: Unit 13 Genetically Modified Organisms". www.learner.org. Retrieved 18 August 2017. ^ Fan M, Tsai J, Chen B, Fan K, LaBaer J (March 2005). "A central repository for published plasmids". Science. 307 (5717): 1877. doi:10.1126/science.307.5717.1877a. PMID 15790830. ^ Cooper GM (2000). "Cells As Experimental Models". The Cell: A Molecular Approach. 2nd edition. ^ Patel P (June 2018). "Microbe Mystery". Scientific American. 319 (1): 18. doi:10.1038/scientificamerican0718-18a. PMID 29924081. ^ Arpino JA, Hancock EJ, Anderson J, Barahona M, Stan GB, Papachristodoulou A, Polizzi K (July 2013). "Tuning the dials of Synthetic Biology". Microbiology. 159 (Pt 7): 1236–53. doi:10.1099/mic.0.067975-0. PMC 3749727. PMID 23704788. ^ Pollack A (7 May 2014). "Researchers Report Breakthrough in Creating Artificial Genetic Code". The New York Times. Retrieved 7 May 2014. ^ a b Kärenlampi SO, von Wright AJ (1 January 2016). Genetically Modified Microorganisms. Encyclopedia of Food and Health. pp. 211–216. doi:10.1016/B978-0-12-384947-2.00356-1. ISBN 9780123849533. ^ Blair R, Regenstein JM (3 August 2015). Genetic Modification and Food Quality: A Down to Earth Analysis. John Wiley & Sons. pp. 20–24. ISBN 9781118756416. ^ a b c Jumba M (2009). Genetically Modified Organisms the Mystery Unraveled. Durham: Eloquent Books. pp. 51–54. ISBN 9781609110819. ^ a b Zhou Y, Lu Z, Wang X, Selvaraj JN, Zhang G (February 2018). "Genetic engineering modification and fermentation optimization for extracellular production of recombinant proteins using Escherichia coli". Applied Microbiology and Biotechnology. 102 (4): 1545–1556. doi:10.1007/s00253-017-8700-z. PMID 29270732. ^ Leader B, Baca QJ, Golan DE (January 2008). "Protein therapeutics: a summary and pharmacological classification". Nature Reviews. Drug Discovery. A guide to drug discovery. 7 (1): 21–39. doi:10.1038/nrd2399. PMID 18097458. ^ Walsh G (April 2005). "Therapeutic insulins and their large-scale manufacture". Applied Microbiology and Biotechnology. 67 (2): 151–9. doi:10.1007/s00253-004-1809-x. PMID 15580495. ^ Pipe SW (May 2008). "Recombinant clotting factors". Thrombosis and Haemostasis. 99 (5): 840–50. doi:10.1160/TH07-10-0593. PMID 18449413. ^ Bryant J, Baxter L, Cave CB, Milne R (July 2007). Bryant J (ed.). "Recombinant growth hormone for idiopathic short stature in children and adolescents". The Cochrane Database of Systematic Reviews (3): CD004440. doi:10.1002/14651858.CD004440.pub2. PMID 17636758. ^ Baxter L, Bryant J, Cave CB, Milne R (January 2007). Bryant J (ed.). "Recombinant growth hormone for children and adolescents with Turner syndrome". The Cochrane Database of Systematic Reviews (1): CD003887. doi:10.1002/14651858.CD003887.pub2. PMID 17253498. ^ Reardon S (June 2018). "Genetically modified bacteria enlisted in fight against disease". Nature. 558 (7711): 497–498. doi:10.1038/d41586-018-05476-4. PMID 29946090. ^ Amarger N (November 2002). "Genetically modified bacteria in agriculture". Biochimie. 84 (11): 1061–72. doi:10.1016/s0300-9084(02)00035-4. PMID 12595134. ^ Sharma B, Dangi AK, Shukla P (March 2018). "Contemporary enzyme based technologies for bioremediation: A review". Journal of Environmental Management. 210: 10–22. doi:10.1016/j.jenvman.2017.12.075. PMID 29329004. ^ a b Yetisen AK, Davis J, Coskun AF, Church GM, Yun SH (December 2015). "Bioart". Trends in Biotechnology. 33 (12): 724–734. doi:10.1016/j.tibtech.2015.09.011. PMID 26617334. ^ Church GM, Gao Y, Kosuri S (September 2012). "Next-generation digital information storage in DNA". Science. 337 (6102): 1628. doi:10.1126/science.1226355. PMID 22903519. ^ Baldo A, van den Akker E, Bergmans HE, Lim F, Pauwels K (December 2013). "General considerations on the biosafety of virus-derived vectors used in gene therapy and vaccination". Current Gene Therapy. 13 (6): 385–94. doi:10.2174/15665232113136660005. PMC 3905712. PMID 24195604. ^ "Is gene therapy available to treat my disorder?". Genetics Home Reference. Retrieved 14 December 2018. ^ a b Aiuti A, Roncarolo MG, Naldini L (June 2017). "ex vivo gene therapy in Europe: paving the road for the next generation of advanced therapy medicinal products". EMBO Molecular Medicine. 9 (6): 737–740. doi:10.15252/emmm.201707573. PMC 5452047. PMID 28396566. ^ a b c d Lundstrom K (May 2018). "Viral Vectors in Gene Therapy". Diseases. 6 (2). doi:10.3390/diseases6020042. PMC 6023384. PMID 29883422. ^ Manservigi R, Epstein AL, Argnani R, Marconi P (2013). HSV as a Vector in Vaccine Development and Gene Therapy. Landes Bioscience. ^ Chan VS (November 2006). "Use of genetically modified viruses and genetically engineered virus-vector vaccines: environmental effects". Journal of Toxicology and Environmental Health. Part A. 69 (21): 1971–7. doi:10.1080/15287390600751405. PMID 16982535. ^ a b Ramezanpour B, Haan I, Osterhaus A, Claassen E (December 2016). "Vector-based genetically modified vaccines: Exploiting Jenner's legacy". Vaccine. 34 (50): 6436–6448. doi:10.1016/j.vaccine.2016.06.059. PMID 28029542. ^ Tameris MD, Hatherill M, Landry BS, Scriba TJ, Snowden MA, Lockhart S, Shea JE, McClain JB, Hussey GD, Hanekom WA, Mahomed H, McShane H (March 2013). "Safety and efficacy of MVA85A, a new tuberculosis vaccine, in infants previously vaccinated with BCG: a randomized, placebo-controlled phase 2b trial". Lancet. 381 (9871): 1021–8. doi:10.1016/S0140-6736(13)60177-4. PMC 5424647. PMID 23391465. ^ Delany I, Rappuoli R, De Gregorio E (June 2014). "Vaccines for the 21st century". EMBO Molecular Medicine. 6 (6): 708–20. doi:10.1002/emmm.201403876. PMC 4203350. PMID 24803000. ^ Bhattacharya, Shaoni. "Genetically-modified virus explodes cancer cells". New Scientist. ^ Khamsi, Roxanne. "GM virus shrinks cancer tumours in humans". New Scientist. ^ Leja J, Yu D, Nilsson B, Gedda L, Zieba A, Hakkarainen T, Åkerström G, Öberg K, Giandomenico V, Essand M (November 2011). "Oncolytic adenovirus modified with somatostatin motifs for selective infection of neuroendocrine tumor cells". Gene Therapy. 18 (11): 1052–62. doi:10.1038/gt.2011.54. PMID 21490682. ^ Breitbach CJ, Thorne SH, Bell JC, Kirn DH (July 2012). "Targeted and armed oncolytic poxviruses for cancer: the lead example of JX-594". Current Pharmaceutical Biotechnology. 13 (9): 1768–72. doi:10.2174/138920112800958922. PMID 21740365. ^ Garber K (March 2006). "China approves world's first oncolytic virus therapy for cancer treatment". Journal of the National Cancer Institute. 98 (5): 298–300. doi:10.1093/jnci/djj111. PMID 16507823. ^ Molteni M (12 April 2017). "Florida's Orange Trees Are Dying, But a Weaponized Virus Could Save Them". Wired. Retrieved 17 April 2017. ^ a b Jelley J (7 August 2002). "GM virus curbs rabbits". Retrieved 16 December 2018. ^ O'Riordan B (26 February 2005). "Virus planned to counter cane toad". The Guardian. ISSN 0261-3077. Retrieved 16 December 2018. ^ Mildura GO. "Virus could sterilise Australia's rabbits". New Scientist. Retrieved 16 December 2018. ^ Angulo E, Cooke B (December 2002). "First synthesize new viruses then regulate their release? The case of the wild rabbit". Molecular Ecology. 11 (12): 2703–9. doi:10.1046/j.1365-294X.2002.01635.x. hdl:10261/45541. PMID 12453252. ^ Pires DP, Cleto S, Sillankorva S, Azeredo J, Lu TK (September 2016). "Genetically Engineered Phages: a Review of Advances over the Last Decade". Microbiology and Molecular Biology Reviews. 80 (3): 523–43. doi:10.1128/MMBR.00069-15. PMC 4981678. PMID 27250768. ^ Lee YJ, Yi H, Kim WJ, Kang K, Yun DS, Strano MS, Ceder G, Belcher AM (May 2009). "Fabricating genetically engineered high-power lithium-ion batteries using multiple virus genes". Science. 324 (5930): 1051–5. doi:10.1126/science.1171541. PMID 19342549. ^ Branduardi P, Smeraldi C, Porro D (2008). "Metabolically engineered yeasts: 'potential' industrial applications". Journal of Molecular Microbiology and Biotechnology. 15 (1): 31–40. doi:10.1159/000111990. PMID 18349548. ^ "GM fungi: New way to produce cheap biofuel - Times of India". The Times of India. Retrieved 17 December 2018. ^ Fang W, Vega-Rodríguez J, Ghosh AK, Jacobs-Lorena M, Kang A, St Leger RJ (February 2011). "Development of transgenic fungi that kill human malaria parasites in mosquitoes". Science. 331 (6020): 1074–7. doi:10.1126/science.1199115. PMC 4153607. PMID 21350178. Lay summary – Scientific American News Letter. ^ Hokanson KE, Dawson WO, Handler AM, Schetelig MF, St Leger RJ (December 2014). "Not all GMOs are crop plants: non-plant GMO applications in agriculture". Transgenic Research. 23 (6): 1057–68. doi:10.1007/s11248-013-9769-5. PMID 24242193. ^ a b Zhao H, Lovett B, Fang W (1 January 2016). "Genetically Engineering Entomopathogenic Fungi". Advances in Genetics. 94: 137–63. doi:10.1016/bs.adgen.2015.11.001. PMID 27131325. ^ Koenraadt CJ, Takken W (April 2011). "Viability of GM fungi crucial to malaria control". Science. 332 (6026): 175. doi:10.1126/science.332.6026.175. PMID 21474739. ^ Waltz E (April 2016). "Gene-edited CRISPR mushroom escapes US regulation". Nature. 532 (7599): 293. doi:10.1038/nature.2016.19754. PMID 27111611. ^ Charles D (15 April 2016). "Will Genetically 'Edited' Food Be Regulated? The Case Of The Mushroom". All Things Considered. National Public Radio. Retrieved 17 December 2018. ^ Zimmer C (27 July 2018). "What Is a Genetically Modified Crop? A European Ruling Sows Confusion". The New York Times. Retrieved 17 December 2018. ^ a b c Walter P, Roberts K, Raff M, Lewis J, Johnson A, Alberts B (2002). "Studying Gene Expression and Function". Molecular Biology of the Cell (4th ed.). ^ Ganapathi TR, Suprasanna P, Rao PS, Bapat VA (2004). "Tobacco (Nicotiana tabacum L.) — A Model System for Tissue Culture Interventions and Genetic Engineering". Indian Journal of Biotechnology. 3: 171–184. ^ Koszowski B, Goniewicz ML, Czogała J, Sobczak A (2007). "Genetycznie modyfikowany tytoń – szansa czy zagrozenie dla palaczy?" [Genetically modified tobacco--chance or threat for smokers?] (PDF). Przeglad Lekarski (in Polish). 64 (10): 908–12. PMID 18409340. ^ Mou B, Scorza R (15 June 2011). Transgenic Horticultural Crops: Challenges and Opportunities. CRC Press. p. 104. ISBN 978-1-4200-9379-7. ^ Gepstein S, Horwitz BA (1995). "The impact of Arabidopsis research on plant biotechnology". Biotechnology Advances. 13 (3): 403–14. PMID 14536094. ^ Holland CK, Jez JM (October 2018). "Arabidopsis: the original plant chassis organism". Plant Cell Reports. 37 (10): 1359–1366. doi:10.1007/s00299-018-2286-5. PMID 29663032. ^ Jefferson RA, Kavanagh TA, Bevan MW (December 1987). "GUS fusions: beta-glucuronidase as a sensitive and versatile gene fusion marker in higher plants". The EMBO Journal. 6 (13): 3901–7. PMC 553867. PMID 3327686. ^ a b "Biotechnology in Ornamental Plants - Pocket K". www.isaaa.org. Retrieved 17 December 2018. ^ Chandler SF, Sanchez C (October 2012). "Genetic modification; the development of transgenic ornamental plant varieties". Plant Biotechnology Journal. 10 (8): 891–903. doi:10.1111/j.1467-7652.2012.00693.x. PMID 22537268. ^ Nosowitz D (15 September 2011). "Suntory Creates Mythical Blue (Or, Um, Lavender-ish) Rose". Popular Science. Retrieved 30 August 2012. ^ "Suntory to sell blue roses overseas". The Japan Times. 11 September 2011. Archived from the original on 22 November 2012. Retrieved 30 August 2012. ^ "World's First 'Blue' Rose Soon Available in U.S". Wired. 14 September 2011. ^ "Green genetic engineering now conquers the ornamental plant market as well". www.biooekonomie-bw.de. Retrieved 17 December 2018. ^ a b Adams JM, Piovesan G, Strauss S, Brown S (1 August 2002). "The Case for Genetic Engineering of Native and Landscape Trees against Introduced Pests and Diseases". Conservation Biology. 16 (4): 874–79. doi:10.1046/j.1523-1739.2002.00523.x. ^ Tripathi S, Suzuki J, Gonsalves D (2007). "Development of genetically engineered resistant papaya for papaya ringspot virus in a timely manner: a comprehensive and successful approach". Methods in Molecular Biology. 354: 197–240. doi:10.1385/1-59259-966-4:197. ISBN 978-1-59259-966-0. PMID 17172756. ^ a b c Qaim M (29 April 2016). "Introduction". Genetically Modified Crops and Agricultural Development. Springer. pp. 1–10. ISBN 9781137405722. ^ a b "Global Status of Commercialized Biotech/GM Crops: 2014 - ISAAA Brief 49-2014". ISAAA.org. Retrieved 15 September 2016. ^ Hakim, Danny (29 October 2016). "Doubts About the Promised Bounty of Genetically Modified Crops". The New York Times. ISSN 0362-4331. Retrieved 5 May 2017. ^ Areal FJ, Riesgo L, Rodríguez-Cerezo E (February 2013). "Economic and agronomic impact of commercialized GM crops: a meta-analysis". The Journal of Agricultural Science. 151 (1): 7–33. doi:10.1017/S0021859612000111. ISSN 0021-8596. ^ Finger R, El Benni N, Kaphengst T, Evans C, Herbert S, Lehmann B, Morse S, Stupak N (10 May 2011). "A Meta Analysis on Farm-Level Costs and Benefits of GM Crops". Sustainability. 3 (5): 743–62. doi:10.3390/su3050743. ^ Klümper W, Qaim M (3 November 2014). "A meta-analysis of the impacts of genetically modified crops". PLOS One. 9 (11): e111629. Bibcode:2014PLoSO...9k1629K. doi:10.1371/journal.pone.0111629. PMC 4218791. PMID 25365303. ^ Darmency H (August 2013). "Pleiotropic effects of herbicide-resistance genes on crop yield: a review". Pest Management Science. 69 (8): 897–904. doi:10.1002/ps.3522. PMID 23457026. ^ Green JM (September 2014). "Current state of herbicides in herbicide-resistant crops". Pest Management Science. 70 (9): 1351–7. doi:10.1002/ps.3727. ^ Fleischer SJ, Hutchison WD, Naranjo SE (2014). "Sustainable Management of Insect-Resistant Crops". Plant Biotechnology. pp. 115–127. doi:10.1007/978-3-319-06892-3_10. ISBN 978-3-319-06891-6. ^ "SGK321". GM Approval Database. ISAAA.org. Retrieved 27 April 2017. ^ Qiu J (October 2008). "Is China ready for GM rice?". Nature. 455 (7215): 850–2. doi:10.1038/455850a. PMID 18923484. ^ Frist B (21 November 2006). "'Green revolution' hero". Washington Times. One existing crop, genetically engineered "golden rice" that produces vitamin A, already holds enormous promise for reducing blindness and dwarfism that result from a vitamin-A deficient diet. ^ Humphrey JH, West KP, Sommer A (1992). "Vitamin A deficiency and attributable mortality among under-5-year-olds". Bulletin of the World Health Organization. 70 (2): 225–32. PMC 2393289. PMID 1600583. ^ Paine JA, Shipton CA, Chaggar S, Howells RM, Kennedy MJ, Vernon G, Wright SY, Hinchliffe E, Adams JL, Silverstone AL, Drake R (April 2005). "Improving the nutritional value of Golden Rice through increased pro-vitamin A content". Nature Biotechnology. 23 (4): 482–7. doi:10.1038/nbt1082. PMID 15793573. ^ "US FDA approves GMO Golden Rice as safe to eat". Genetic Literacy Project. 29 May 2018. Retrieved 30 May 2018. ^ Gasdaska JR, Spencer D, Dickey L (March 2003). "Advantages of Therapeutic Protein Production in the Aquatic Plant Lemna". BioProcessing Journal: 49–56. ^ Büttner-Mainik A, Parsons J, Jérôme H, Hartmann A, Lamer S, Schaaf A, Schlosser A, Zipfel PF, Reski R, Decker EL (April 2011). "Production of biologically active recombinant human factor H in Physcomitrella". Plant Biotechnology Journal. 9 (3): 373–83. doi:10.1111/j.1467-7652.2010.00552.x. PMID 20723134. ^ Baur A, Reski R, Gorr G (May 2005). "Enhanced recovery of a secreted recombinant human growth factor using stabilizing additives and by co-expression of human serum albumin in the moss Physcomitrella patens". Plant Biotechnology Journal. 3 (3): 331–40. doi:10.1111/j.1467-7652.2005.00127.x. PMID 17129315. ^ a b Hammond J, McGarvey P, Yusibov V (6 December 2012). Plant Biotechnology: New Products and Applications. Springer Science & Business Media. pp. 7–8. ISBN 9783642602344. ^ Börnke F, Broer I (June 2010). "Tailoring plant metabolism for the production of novel polymers and platform chemicals". Current Opinion in Plant Biology. 13 (3): 354–62. doi:10.1016/j.pbi.2010.01.005. PMID 20171137. ^ Lehr F, Posten C (June 2009). "Closed photo-bioreactors as tools for biofuel production". Current Opinion in Biotechnology. 20 (3): 280–5. doi:10.1016/j.copbio.2009.04.004. PMID 19501503. ^ "UNL's AgBiosafety for Educators". agbiosafety.unl.edu. Retrieved 18 December 2018. ^ "ProCellEx® Platform". Protalix Biotherapeutics. Archived from the original on 27 October 2012. ^ Gali Weinreb and Koby Yeshayahou for Globes 2 May 2012. "FDA approves Protalix Gaucher treatment Archived 29 May 2013 at the Wayback Machine"
^ Concha C, Cañas R, Macuer J, Torres MJ, Herrada AA, Jamett F, Ibáñez C (May 2017). "Disease Prevention: An Opportunity to Expand Edible Plant-Based Vaccines?". Vaccines. 5 (2): 14. doi:10.3390/vaccines5020014. PMC 5492011. PMID 28556800. ^ a b Forabosco F, Löhmus M, Rydhmer L, Sundström LF (May 2013). "Genetically modified farm animals and fish in agriculture: A review". Livestock Science. 153 (1–3): 1–9. doi:10.1016/j.livsci.2013.01.002. ^ "The Superpowers of Genetically Modified Pigs". The Scientist Magazine®. Retrieved 5 February 2019. ^ Rudinko, Larisa (20). Guidance for industry. USA: Center for veterinary medicine Link. ^ Jaenisch R, Mintz B (April 1974). "Simian virus 40 DNA sequences in DNA of healthy adult mice derived from preimplantation blastocysts injected with viral DNA". Proceedings of the National Academy of Sciences of the United States of America. 71 (4): 1250–4. Bibcode:1974PNAS...71.1250J. doi:10.1073/pnas.71.4.1250. PMC 388203. PMID 4364530. ^ "How CRISPR is Spreading Through the Animal Kingdom". www.pbs.org. Retrieved 20 December 2018. ^ a b Perleberg C, Kind A, Schnieke A (January 2018). "Genetically engineered pigs as models for human disease". Disease Models & Mechanisms. 11 (1). doi:10.1242/dmm.030783. PMC 5818075. PMID 29419487. ^ Sato K, Sasaki E (February 2018). "Genetic engineering in nonhuman primates for human disease modeling". Journal of Human Genetics. 63 (2): 125–131. doi:10.1038/s10038-017-0351-5. PMID 29203824. ^ Sasaki E, Suemizu H, Shimada A, Hanazawa K, Oiwa R, Kamioka M, Tomioka I, Sotomaru Y, Hirakawa R, Eto T, Shiozawa S, Maeda T, Ito M, Ito R, Kito C, Yagihashi C, Kawai K, Miyoshi H, Tanioka Y, Tamaoki N, Habu S, Okano H, Nomura T (May 2009). "Generation of transgenic non-human primates with germline transmission". Nature. 459 (7246): 523–7. Bibcode:2009Natur.459..523S. doi:10.1038/nature08090. PMID 19478777. ^ Schatten G, Mitalipov S (May 2009). "Developmental biology: Transgenic primate offspring". Nature. 459 (7246): 515–6. Bibcode:2009Natur.459..515S. doi:10.1038/459515a. PMC 2777739. PMID 19478771. ^ Cyranoski D (May 2009). "Marmoset model takes centre stage". Nature. 459 (7246): 492. doi:10.1038/459492a. PMID 19478751. ^ Spencer LT, Humphries JE, Brantly ML (May 2005). "Antibody response to aerosolized transgenic human alpha1-antitrypsin". The New England Journal of Medicine. 352 (19): 2030–1. doi:10.1056/nejm200505123521923. PMID 15888711. ^ Zimmer, Carl (15 October 2015). "Editing of Pig DNA May Lead to More Organs for People" – via NYTimes.com. ^ Zeyland J, Gawrońska B, Juzwa W, Jura J, Nowak A, Słomski R, Smorąg Z, Szalata M, Woźniak A, Lipiński D (August 2013). "Transgenic pigs designed to express human α-galactosidase to avoid humoral xenograft rejection". Journal of Applied Genetics. 54 (3): 293–303. doi:10.1007/s13353-013-0156-y. PMC 3720986. PMID 23780397. ^ "Pig Heart Transplants For Humans Could Be On Their Way". IFLScience. ^ Reardon, Sara (12 November 2015). "New life for pig-to-human transplants". Nature News. 527 (7577): 152. doi:10.1038/527152a – via www.nature.com. ^ "Genetically modified pig lungs or lab-grown lungs: Which is the future of our organ supply?". Genetic Literacy Project. 6 May 2014. ^ Wu J, Platero-Luengo A, Sakurai M, Sugawara A, Gil MA, Yamauchi T, Suzuki K, Bogliotti YS, Cuello C, Morales Valencia M, Okumura D, Luo J, Vilariño M, Parrilla I, Soto DA, Martinez CA, Hishida T, Sánchez-Bautista S, Martinez-Martinez ML, Wang H, Nohalez A, Aizawa E, Martinez-Redondo P, Ocampo A, Reddy P, Roca J, Maga EA, Esteban CR, Berggren WT, Nuñez Delicado E, Lajara J, Guillen I, Guillen P, Campistol JM, Martinez EA, Ross PJ, Izpisua Belmonte JC (January 2017). "Interspecies Chimerism with Mammalian Pluripotent Stem Cells". Cell. 168 (3): 473–486.e15. doi:10.1016/j.cell.2016.12.036. PMC 5679265. PMID 28129541. ^ Lai L, Kang JX, Li R, Wang J, Witt WT, Yong HY, Hao Y, Wax DM, Murphy CN, Rieke A, Samuel M, Linville ML, Korte SW, Evans RW, Starzl TE, Prather RS, Dai Y (April 2006). "Generation of cloned transgenic pigs rich in omega-3 fatty acids" (PDF). Nature Biotechnology. 24 (4): 435–6. doi:10.1038/nbt1198. PMC 2976610. PMID 16565727. Archived from the original (PDF) on 16 August 2009. ^ Tucker I (24 June 2018). "Genetically modified animals". The Guardian. ISSN 0261-3077. Retrieved 21 December 2018. ^ Zyga L (2010). "Scientist bred goats that produce spider silk". Phys.org. Archived from the original on 30 April 2015. ^ a b "Enviropig". Canada: University of Guelph. 2010. Archived from the original on 30 January 2016. ^ Schimdt S (22 June 2012). "Genetically engineered pigs killed after funding ends". Postmedia News. Retrieved 31 July 2012. ^ "Enviropig – Environmental Benefits". Canada: University of Guelph. Archived from the original on 27 February 2010. Retrieved 8 March 2010. ^ Gray R (2011). "Genetically modified cows produce 'human' milk". ^ "Genetically modified cows producing human milk". Classical Medicine Journal. 14 April 2010. Archived from the original on 6 November 2014. ^ Yapp R (11 June 2011). "Scientists create cow that produces 'human' milk". The Daily Telegraph. London. Retrieved 15 June 2012. ^ Jabed A, Wagner S, McCracken J, Wells DN, Laible G (October 2012). "Targeted microRNA expression in dairy cattle directs production of β-lactoglobulin-free, high-casein milk". Proceedings of the National Academy of Sciences of the United States of America. 109 (42): 16811–6. Bibcode:2012PNAS..10916811J. doi:10.1073/pnas.1210057109. PMC 3479461. PMID 23027958. ^ "Green fluorescent protein takes Nobel prize". Lewis Brindley. Retrieved 31 May 2015. ^ Alberts B, Johnson A, Lewis J, Raff M, Roberts K, Walter P (2002). "Studying Gene Expression and Function". Molecular Biology of the Cell (4th ed.). ^ Randall S (2008). "Genetically Modified Pigs for Medicine and Agriculture" (PDF). Biotechnology and Genetic Engineering Reviews. 25: 245–66. Archived from the original (PDF) on 31 August 2012. ^ Wongsrikeao P, Saenz D, Rinkoski T, Otoi T, Poeschla E (September 2011). "Antiviral restriction factor transgenesis in the domestic cat". Nature Methods. 8 (10): 853–9. doi:10.1038/nmeth.1703. PMC 4006694. PMID 21909101. ^ Staff (3 April 2012). "Biology of HIV". National Institute of Allergy and Infectious Diseases. Archived from the original on 11 April 2014. ^ Biello D. "Ancient DNA Could Return Passenger Pigeons to the Sky". Scientific American. Retrieved 23 December 2018. ^ Sarchet, Penny. "Can we grow woolly mammoths in the lab? George Church hopes so". New Scientist. Retrieved 23 December 2018. ^ Hawks, John (19 February 2017). "How mammoth cloning became fake news". John Hawks. Retrieved 20 January 2019. ^ Shapiro B (November 2015). "Mammoth 2.0: will genome engineering resurrect extinct species?". Genome Biology. 16 (1): 228. doi:10.1186/s13059-015-0800-4. PMC 4632474. PMID 26530525. ^ Selkirk SM (October 2004). "Gene therapy in clinical medicine". Postgraduate Medical Journal. 80 (948): 560–70. doi:10.1136/pgmj.2003.017764. PMC 1743106. PMID 15466989. ^ Cavazzana-Calvo M, Fischer A (June 2007). "Gene therapy for severe combined immunodeficiency: are we there yet?". The Journal of Clinical Investigation. 117 (6): 1456–65. doi:10.1172/JCI30953. PMC 1878528. PMID 17549248. ^ Richards S (6 November 2012). "Gene therapy arrives in Europe". The Scientist. ^ Rosenecker J, Huth S, Rudolph C (October 2006). "Gene therapy for cystic fibrosis lung disease: current status and future perspectives". Current Opinion in Molecular Therapeutics. 8 (5): 439–45. PMID 17078386. ^ Persons DA, Nienhuis AW (July 2003). "Gene therapy for the hemoglobin disorders". Current Hematology Reports. 2 (4): 348–55. PMID 12901333. ^ LeWitt PA, Rezai AR, Leehey MA, Ojemann SG, Flaherty AW, Eskandar EN, et al. (April 2011). "AAV2-GAD gene therapy for advanced Parkinson's disease: a double-blind, sham-surgery controlled, randomized trial". The Lancet. Neurology. 10 (4): 309–19. doi:10.1016/S1474-4422(11)70039-4. PMID 21419704. ^ Urbina Z (12 February 2013). "Genetically Engineered Virus Fights Liver Cancer". United Academics. Archived from the original on 16 February 2013. Retrieved 15 February 2013. ^ "Treatment for Leukemia Is Showing Early Promise". The New York Times. Associated Press. 11 August 2011. p. A15. Retrieved 21 January 2013. ^ Coghlan A (26 March 2013). "Gene therapy cures leukaemia in eight days". The New Scientist. Retrieved 15 April 2013. ^ "Gene therapy cures diabetic dogs". New Scientist. 13 February 2013. Retrieved 15 February 2013. ^ "New gene therapy trial gives hope to people with heart failure". British Heart Foundation. 30 April 2013. Retrieved 5 May 2013. ^ Foster K, Foster H, Dickson JG (December 2006). "Gene therapy progress and prospects: Duchenne muscular dystrophy". Gene Therapy. 13 (24): 1677–85. doi:10.1038/sj.gt.3302877. PMID 17066097. ^ "1990 The Declaration of Inuyama". 5 August 2001. Archived from the original on 5 August 2001. ^ Liang P, Xu Y, Zhang X, Ding C, Huang R, Zhang Z, Lv J, Xie X, Chen Y, Li Y, Sun Y, Bai Y, Songyang Z, Ma W, Zhou C, Huang J (May 2015). "CRISPR/Cas9-mediated gene editing in human tripronuclear zygotes". Protein & Cell. 6 (5): 363–372. doi:10.1007/s13238-015-0153-5. PMID 25894090. ^ Wang Q, Tan X, Jiao S, You F, Zhang PJ (24 July 2014). "Analyzing cold tolerance mechanism in transgenic zebrafish (Danio rerio)". PLOS One. 9 (7): e102492. doi:10.1371/journal.pone.0102492. PMC 4109919. PMID 25058652. ^ "Half Of Fish Consumed Globally Is Now Raised On Farms, Study Finds". ScienceDaily. Retrieved 21 December 2018. ^ "Progress and biotechnological prospects in fish transgenesis". Biotechnology Advances. 35 (6): 832–844. 1 November 2017. doi:10.1016/j.biotechadv.2017.06.002. ISSN 0734-9750. ^ Nebert DW, Stuart GW, Solis WA, Carvan MJ (January 2002). "Use of reporter genes and vertebrate DNA motifs in transgenic zebrafish as sentinels for assessing aquatic pollution". Environmental Health Perspectives. 110 (1): A15. doi:10.1289/ehp.110-a15. PMC 1240712. PMID 11813700. ^ Mattingly CJ, McLachlan JA, Toscano WA (August 2001). "Green fluorescent protein (GFP) as a marker of aryl hydrocarbon receptor (AhR) function in developing zebrafish (Danio rerio)". Environmental Health Perspectives. 109 (8): 845–849. doi:10.1289/ehp.01109845. PMC 1240414. PMID 11564622. ^ Hallerman E (June 2004). "Glofish, the first GM animal commercialized: profits amid controversy". ISB News Report. ^ Hackett PB, Ekker SE, Essner JJ (2004). "Chapter 16: Applications of transposable elements in fish for transgenesis and functional genomics". In Gong Z, Korzh V (eds.). Fish Development and Genetics. World Scientific, Inc. pp. 532–80. ^ Meyers JR (2018). "Zebrafish: Development of a Vertebrate Model Organism". 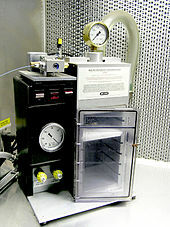 Current Protocols in Essential Laboratory Techniques. 16 (1): e19. doi:10.1002/cpet.19. ^ Lu JW, Ho YJ, Ciou SC, Gong Z (September 2017). "Innovative Disease Model: Zebrafish as an In Vivo Platform for Intestinal Disorder and Tumors". Biomedicines. 5 (4). doi:10.3390/biomedicines5040058. PMC 5744082. PMID 28961226. ^ Barriuso J, Nagaraju R, Hurlstone A (March 2015). "Zebrafish: a new companion for translational research in oncology". Clinical Cancer Research. 21 (5): 969–75. doi:10.1158/1078-0432.CCR-14-2921. PMC 5034890. PMID 25573382. ^ Burket CT, Montgomery JE, Thummel R, Kassen SC, LaFave MC, Langenau DM, Zon LI, Hyde DR (April 2008). "Generation and characterization of transgenic zebrafish lines using different ubiquitous promoters". Transgenic Research. 17 (2): 265–79. doi:10.1007/s11248-007-9152-5. PMC 3660017. PMID 17968670. ^ Du SJ, Gong Z, Fletcher GL, Shears MA, King MJ, Idler DR, Hew CL (1992). "Growth Enhancement in Transgenic Atlantic Salmon by the Use of an 'All Fish' Chimeric Growth Hormone Gene Construct". Nature Biotechnology. 10 (2): 176–181. doi:10.1038/nbt0292-176. ^ Devlin RH, Biagi CA, Yesaki TY, Smailus DE, Byatt JC (February 2001). "Growth of domesticated transgenic fish". Nature. 409 (6822): 781–782. Bibcode:2001Natur.409..781D. doi:10.1038/35057314. PMID 11236982. ^ Rahman MA, et al. (2001). "Growth and nutritional trials on transgenic Nile tilapia containing an exogenous fish growth hormone gene". Journal of Fish Biology. 59 (1): 62–78. doi:10.1111/j.1095-8649.2001.tb02338.x. ^ Pollack A (21 December 2012). "Engineered Fish Moves a Step Closer to Approval". The New York Times. ^ "FDA Has Determined That the AquAdvantage Salmon is as Safe to Eat as Non-GE Salmon". U.S. Food & Drug Administration. 19 November 2015. Retrieved 9 February 2018. ^ Waltz,Nature, Emily. "First Genetically Engineered Salmon Sold in Canada". Scientific American. Retrieved 8 August 2017. ^ Gallegos, Jenna (4 August 2017). "GMO salmon caught in U.S. regulatory net, but Canadians have eaten 5 tons". The Washington Post. Retrieved 5 February 2019. ^ Cukier HN, Perez AM, Collins AL, Zhou Z, Zoghbi HY, Botas J (September 2008). "Genetic modifiers of MeCP2 function in Drosophila". PLoS Genetics. 4 (9): e1000179. doi:10.1371/journal.pgen.1000179. PMC 2518867. PMID 18773074. ^ "Online Education Kit: 1981–82: First Transgenic Mice and Fruit Flies". genome.gov. ^ Weasner BM, Zhu J, Kumar JP (2017). "FLPing Genes On and Off in Drosophila". Methods in Molecular Biology. 1642: 195–209. doi:10.1007/978-1-4939-7169-5_13. PMC 5858584. PMID 28815502. ^ "Drosophila – a versatile model in biology & medicine". Materials Today. 14 (5): 190–195. 1 May 2011. doi:10.1016/S1369-7021(11)70113-4. ^ Ren X, Holsteens K, Li H, Sun J, Zhang Y, Liu LP, Liu Q, Ni JQ (May 2017). "Genome editing in Drosophila melanogaster: from basic genome engineering to the multipurpose CRISPR-Cas9 system". Science China Life Sciences. 60 (5): 476–489. doi:10.1007/s11427-017-9029-9. PMID 28527116. ^ Corby-Harris V, Drexler A, Watkins de Jong L, Antonova Y, Pakpour N, Ziegler R, Ramberg F, Lewis EE, Brown JM, Luckhart S, Riehle MA (July 2010). Vernick KD (ed.). "Activation of Akt signaling reduces the prevalence and intensity of malaria parasite infection and lifespan in Anopheles stephensi mosquitoes". PLoS Pathogens. 6 (7): e1001003. doi:10.1371/journal.ppat.1001003. PMC 2904800. PMID 20664791. ^ Gallagher, James (20 April 2011). "GM mosquitoes offer malaria hope". BBC News, Health. Retrieved 22 April 2011. ^ Windbichler N, Menichelli M, Papathanos PA, Thyme SB, Li H, Ulge UY, Hovde BT, Baker D, Monnat RJ, Burt A, Crisanti A (May 2011). "A synthetic homing endonuclease-based gene drive system in the human malaria mosquito". Nature. 473 (7346): 212–5. Bibcode:2011Natur.473..212W. doi:10.1038/nature09937. PMC 3093433. PMID 21508956. ^ Wise de Valdez MR, Nimmo D, Betz J, Gong HF, James AA, Alphey L, Black WC (March 2011). "Genetic elimination of dengue vector mosquitoes". Proceedings of the National Academy of Sciences of the United States of America. 108 (12): 4772–5. Bibcode:2011PNAS..108.4772W. doi:10.1073/pnas.1019295108. PMC 3064365. PMID 21383140. ^ a b Knapton S (6 February 2016). "Releasing millions of GM mosquitoes 'could solve zika crisis'". The Telegraph. Retrieved 14 March 2016. ^ Harris AF, Nimmo D, McKemey AR, Kelly N, Scaife S, Donnelly CA, Beech C, Petrie WD, Alphey L (October 2011). "Field performance of engineered male mosquitoes". Nature Biotechnology. 29 (11): 1034–7. doi:10.1038/nbt.2019. PMID 22037376. ^ Benedict MQ, Robinson AS (August 2003). "The first releases of transgenic mosquitoes: an argument for the sterile insect technique". Trends in Parasitology. 19 (8): 349–55. doi:10.1016/s1471-4922(03)00144-2. PMID 12901936. ^ a b Zhang S (8 September 2017). "Genetically Modified Moths Come to New York". The Atlantic. Retrieved 23 December 2018. ^ Scharping N (10 May 2017). "After Mosquitos, Moths Are the Next Target For Genetic Engineering". Discover Magazine. Retrieved 23 December 2018. ^ Reeves R, Phillipson M (January 2017). "Mass Releases of Genetically Modified Insects in Area-Wide Pest Control Programs and Their Impact on Organic Farmers". Sustainability. 9 (1): 59. doi:10.3390/su9010059. ^ Simmons GS, McKemey AR, Morrison NI, O'Connell S, Tabashnik BE, Claus J, Fu G, Tang G, Sledge M, Walker AS, Phillips CE, Miller ED, Rose RI, Staten RT, Donnelly CA, Alphey L (13 September 2011). "Field performance of a genetically engineered strain of pink bollworm". PLOS One. 6 (9): e24110. doi:10.1371/journal.pone.0024110. PMC 3172240. PMID 21931649. ^ Xu H, O'Brochta DA (July 2015). "Advanced technologies for genetically manipulating the silkworm Bombyx mori, a model Lepidopteran insect". Proceedings. Biological Sciences. 282 (1810). doi:10.1098/rspb.2015.0487. PMC 4590473. PMID 26108630. ^ Tomita M (April 2011). "Transgenic silkworms that weave recombinant proteins into silk cocoons". Biotechnology Letters. 33 (4): 645–54. doi:10.1007/s10529-010-0498-z. PMID 21184136. ^ Xu J, Dong Q, Yu Y, Niu B, Ji D, Li M, Huang Y, Chen X, Tan A (August 2018). "Bombyx mori". Proceedings of the National Academy of Sciences of the United States of America. 115 (35): 8757–8762. doi:10.1073/pnas.1806805115. PMC 6126722. PMID 30082397. ^ Le Page M. "GM worms make a super-silk completely unknown in nature". New Scientist. Retrieved 23 December 2018. ^ "Poultry scientists develop transgenic chicken to aid study of embryo development". North Carolina State University. Retrieved 23 December 2018. ^ "Genetically modified chickens that don't transmit bird flu developed; Breakthrough could prevent future bird flu epidemics". ScienceDaily. Retrieved 23 December 2018. ^ Botelho JF, Smith-Paredes D, Soto-Acuña S, O'Connor J, Palma V, Vargas AO (March 2016). "Molecular development of fibular reduction in birds and its evolution from dinosaurs". Evolution; International Journal of Organic Evolution. 70 (3): 543–54. doi:10.1111/evo.12882. PMC 5069580. PMID 26888088. ^ Becker R. "US government approves transgenic chicken". Nature News. doi:10.1038/nature.2015.18985. ^ Fini JB, Le Mevel S, Turque N, Palmier K, Zalko D, Cravedi JP, Demeneix BA (August 2007). "An in vivo multiwell-based fluorescent screen for monitoring vertebrate thyroid hormone disruption". Environmental Science & Technology. 41 (16): 5908–14. Bibcode:2007EnST...41.5908F. doi:10.1021/es0704129. PMID 17874805. ^ "Removing Threat from Invasive Species with Genetic Engineering?". Science in the News. 28 July 2014. Retrieved 23 December 2018. ^ "Cane toads to get the Crispr treatment". Radio National. 17 November 2017. Retrieved 23 December 2018. ^ "History of research on C. elegans and other free-living nematodes as model organisms". www.wormbook.org. Retrieved 24 December 2018. ^ Hopkin M (2 October 2006). "RNAi scoops medical Nobel". Nature News. doi:10.1038/news061002-2. ^ Conte D, MacNeil LT, Walhout AJ, Mello CC (January 2015). "RNA Interference in Caenorhabditis elegans". Current Protocols in Molecular Biology. 109: 26.3.1–30. doi:10.1002/0471142727.mb2603s109. PMC 5396541. PMID 25559107. ^ a b Praitis V, Maduro MF (2011). "Transgenesis in C. elegans". Methods in Cell Biology. 106: 161–85. doi:10.1016/B978-0-12-544172-8.00006-2. PMID 22118277. ^ Diogo J, Bratanich A (November 2014). "The nematode Caenorhabditis elegans as a model to study viruses". Archives of Virology. 159 (11): 2843–51. doi:10.1007/s00705-014-2168-2. PMID 25000902. ^ Tejeda-Benitez L, Olivero-Verbel J (2016). "Caenorhabditis elegans, a Biological Model for Research in Toxicology". Reviews of Environmental Contamination and Toxicology. 237: 1–35. doi:10.1007/978-3-319-23573-8_1. PMID 26613986. ^ Schmidt J, Schmidt T (2018). "Animal Models of Machado-Joseph Disease". Advances in Experimental Medicine and Biology. 1049: 289–308. doi:10.1007/978-3-319-71779-1_15. PMID 29427110. ^ Griffin EF, Caldwell KA, Caldwell GA (December 2017). "Genetic and Pharmacological Discovery for Alzheimer's Disease Using Caenorhabditis elegans". ACS Chemical Neuroscience. 8 (12): 2596–2606. doi:10.1021/acschemneuro.7b00361. PMID 29022701. ^ Daniells C, Mutwakil MH, Power RS, David HE, De Pomerai DI (2002). "Transgenic Nematodes as Biosensors of Environmental Stress". Biotechnology for the Environment: Strategy and Fundamentals. Focus on Biotechnology. Springer, Dordrecht. pp. 221–236. doi:10.1007/978-94-010-0357-5_15. ISBN 9789401039079. Retrieved 24 December 2018. ^ "More valuable than gold, but not for long: genetically-modified sea cucumbers headed to China's dinner tables". South China Morning Post. 5 August 2015. Retrieved 23 December 2018. ^ Zeng A, Li H, Guo L, Gao X, McKinney S, Wang Y, et al. (June 2018). "Prospectively Isolated Tetraspanin+ Neoblasts Are Adult Pluripotent Stem Cells Underlying Planaria Regeneration". Cell. 173 (7): 1593–1608.e20. doi:10.1016/j.cell.2018.05.006. PMID 29906446. Lay summary – Nature. ^ Wudarski J, Simanov D, Ustyantsev K, de Mulder K, Grelling M, Grudniewska M, Beltman F, Glazenburg L, Demircan T, Wunderer J, Qi W, Vizoso DB, Weissert PM, Olivieri D, Mouton S, Guryev V, Aboobaker A, Schärer L, Ladurner P, Berezikov E (December 2017). "Efficient transgenesis and annotated genome sequence of the regenerative flatworm model Macrostomum lignano". Nature Communications. 8 (1): 2120. doi:10.1038/s41467-017-02214-8. ^ Zantke J, Bannister S, Rajan VB, Raible F, Tessmar-Raible K (May 2014). "Genetic and genomic tools for the marine annelid Platynereis dumerilii". Genetics. 197 (1): 19–31. doi:10.1534/genetics.112.148254. PMID 24807110. ^ Wittlieb J, Khalturin K, Lohmann JU, Anton-Erxleben F, Bosch TC (April 2006). "Transgenic Hydra allow in vivo tracking of individual stem cells during morphogenesis". Proceedings of the National Academy of Sciences of the United States of America. 103 (16): 6208–11. Bibcode:2006PNAS..103.6208W. doi:10.1073/pnas.0510163103. PMC 1458856. PMID 16556723. ^ Perry KJ, Henry JQ (February 2015). "CRISPR/Cas9-mediated genome modification in the mollusc, Crepidula fornicata". Genesis. 53 (2): 237–44. doi:10.1002/dvg.22843. PMID 25529990. ^ Nomura T, Yamashita W, Gotoh H, Ono K (24 February 2015). "Genetic manipulation of reptilian embryos: toward an understanding of cortical development and evolution". Frontiers in Neuroscience. 9: 45. doi:10.3389/fnins.2015.00045. PMC 4338674. PMID 25759636. ^ Rasmussen RS, Morrissey MT (2007). "Biotechnology in Aquaculture: Transgenics and Polyploidy". Comprehensive Reviews in Food Science and Food Safety. 6 (1): 2–16. doi:10.1111/j.1541-4337.2007.00013.x. ^ Ebert MS, Sharp PA (November 2010). "MicroRNA sponges: progress and possibilities". RNA. 16 (11): 2043–50. doi:10.1261/rna.2414110. PMC 2957044. PMID 20855538. ^ Schmid RD, Schmidt-Dannert C (31 May 2016). Biotechnology: An Illustrated Primer. John Wiley & Sons. p. 332. ISBN 9783527335152. ^ a b Kimman TG, Smit E, Klein MR (July 2008). "Evidence-based biosafety: a review of the principles and effectiveness of microbiological containment measures". Clinical Microbiology Reviews. 21 (3): 403–25. doi:10.1128/CMR.00014-08. PMC 2493080. PMID 18625678. ^ "The History and Future of GM Potatoes". PotatoPro.com. 11 December 2013. ^ Sifferlin, Alexandra (3 October 2015). "Over Half of E.U. Countries Are Opting Out of GMOs". Time. 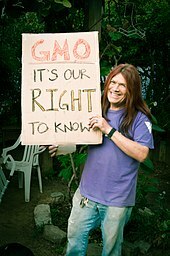 ^ "Where are GMOs grown and banned?". GMO FAQ. 7 February 2016. Retrieved 11 February 2019. ^ Purnhagen K, Wesseler J (2016). "The "Honey" Judgment of Bablok and Others Versus Freistaat Bayern in the Court of Justice of the European Union: Implications for Co-existence.". The coexistence of genetically modified, organic and conventional foods. New York, NY. : Springer. pp. 149–165. ^ Wesseler J, Purnhagen K. "Present and Future EU GMO policy". In Oskam A, Meesters G, Silvis H (eds.). EU Policy for Agriculture, Food and Rural Areas (2nd ed.). Wageningen: Wageningen Academic Publishers. pp. 23–332. ^ Wesseler J, Purnhagen K (2016). "Social, Economic and Legal Avenues". In Kalaitzandonakes N, et al. (eds.). The Coexistence of Genetically Modified, Organic and Conventional Foods. New York: Springer Science. pp. 71–85. ^ Beckmann V, Soregaroli C, Wesseler J (July 2011). "Chapter 8: Coexistence of Genetically Modified (GM) and Non-Modified (non-GM) crops: Are the Two Main Property Rights Regimes Equivalent with Respect to the Coexistence Value?". In Carter G, Moschini G, Sheldon I (eds.). Genetically modified food and global welfare. Frontiers of Economics and Globalization. 10. Bingley, UK: Emerald Group Publishing. pp. 201–224. ^ "Regulation (EC) No 1829/2003 of the European Parliament and of the Council of 22 September 2003 On Genetically Modified Food And Feed" (PDF). Official Journal of the European Union L 268/3 (21). The European Parliament and the Council of the European Union. 2003. Archived from the original (PDF) on 20 January 2014. The labeling should include objective information to the effect that a food or feed consists of, contains or is produced from GMOs. Clear labeling, irrespective of the detectability of DNA or protein resulting from the genetic modification in the final product, meets the demands expressed in numerous surveys by a large majority of consumers, facilitates informed choice and precludes potential misleading of consumers as regards methods of manufacture or production. ^ Hallenbeck, Terri (27 April 2014). "How GMO labeling came to pass in Vermont". Burlington Free Press. Retrieved 28 May 2014. ^ Davison J (2010). "GM plants: Science, politics and EC regulations". Plant Science. 178 (2): 94–98. doi:10.1016/j.plantsci.2009.12.005. ^ Smithonian (2015). "Some Brands Are Labeling Products "GMO-free" Even if They Don't Have Genes". ^ Sheldon IM (1 March 2002). "Regulation of biotechnology: will we ever 'freely' trade GMOs?". European Review of Agricultural Economics. 29 (1): 155–76. CiteSeerX 10.1.1.596.7670. doi:10.1093/erae/29.1.155. ^ "Q&A: genetically modified food". World Health Organization. Retrieved 7 May 2017. ^ Nicolia A, Manzo A, Veronesi F, Rosellini D (March 2014). "An overview of the last 10 years of genetically engineered crop safety research" (PDF). Critical Reviews in Biotechnology. 34 (1): 77–88. doi:10.3109/07388551.2013.823595. PMID 24041244. We have reviewed the scientific literature on GE crop safety for the last 10 years that catches the scientific consensus matured since GE plants became widely cultivated worldwide, and we can conclude that the scientific research conducted so far has not detected any significant hazard directly connected with the use of GM crops. Domingo JL, Giné Bordonaba J (May 2011). "A literature review on the safety assessment of genetically modified plants" (PDF). Environment International. 37 (4): 734–42. doi:10.1016/j.envint.2011.01.003. PMID 21296423. In spite of this, the number of studies specifically focused on safety assessment of GM plants is still limited. 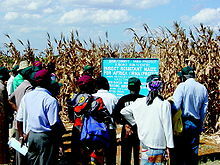 However, it is important to remark that for the first time, a certain equilibrium in the number of research groups suggesting, on the basis of their studies, that a number of varieties of GM products (mainly maize and soybeans) are as safe and nutritious as the respective conventional non-GM plant, and those raising still serious concerns, was observed. Moreover, it is worth mentioning that most of the studies demonstrating that GM foods are as nutritional and safe as those obtained by conventional breeding, have been performed by biotechnology companies or associates, which are also responsible of commercializing these GM plants. Anyhow, this represents a notable advance in comparison with the lack of studies published in recent years in scientific journals by those companies. Krimsky S (2015). "An Illusory Consensus behind GMO Health Assessment" (PDF). Science, Technology, & Human Values. 40 (6): 1–32. doi:10.1177/0162243915598381. Archived from the original (PDF) on 7 February 2016. Retrieved 7 July 2016. I began this article with the testimonials from respected scientists that there is literally no scientific controversy over the health effects of GMOs. My investigation into the scientific literature tells another story. ^ "Statement by the AAAS Board of Directors On Labeling of Genetically Modified Foods" (PDF). American Association for the Advancement of Science. 20 October 2012. Retrieved 8 February 2016. The EU, for example, has invested more than €300 million in research on the biosafety of GMOs. Its recent report states: "The main conclusion to be drawn from the efforts of more than 130 research projects, covering a period of more than 25 years of research and involving more than 500 independent research groups, is that biotechnology, and in particular GMOs, are not per se more risky than e.g. conventional plant breeding technologies." The World Health Organization, the American Medical Association, the U.S. National Academy of Sciences, the British Royal Society, and every other respected organization that has examined the evidence has come to the same conclusion: consuming foods containing ingredients derived from GM crops is no riskier than consuming the same foods containing ingredients from crop plants modified by conventional plant improvement techniques. Pinholster G (25 October 2012). "AAAS Board of Directors: Legally Mandating GM Food Labels Could "Mislead and Falsely Alarm Consumers"". American Association for the Advancement of Science. Retrieved 8 February 2016. ^ A decade of EU-funded GMO research (2001–2010) (PDF). Directorate-General for Research and Innovation. Biotechnologies, Agriculture, Food. European Commission, European Union. 2010. doi:10.2777/97784. ISBN 978-92-79-16344-9. Retrieved 8 February 2016. ^ "Report 2 of the Council on Science and Public Health (A-12): Labeling of Bioengineered Foods" (PDF). American Medical Association. 2012. Archived from the original (PDF) on 7 September 2012. Retrieved 19 March 2016. Bioengineered foods have been consumed for close to 20 years, and during that time, no overt consequences on human health have been reported and/or substantiated in the peer-reviewed literature. ^ Some medical organizations, including the British Medical Association, advocate further caution based upon the precautionary principle: "Genetically modified foods and health: a second interim statement" (PDF). British Medical Association. March 2004. Retrieved 21 March 2016. In our view, the potential for GM foods to cause harmful health effects is very small and many of the concerns expressed apply with equal vigour to conventionally derived foods. However, safety concerns cannot, as yet, be dismissed completely on the basis of information currently available. ^ Schütte G, Eckerstorfer M, Rastelli V, Reichenbecher W, Restrepo-Vassalli S, Ruohonen-Lehto M, Saucy AW, Mertens M (21 January 2017). "Herbicide resistance and biodiversity: agronomic and environmental aspects of genetically modified herbicide-resistant plants". Environmental Sciences Europe. 29 (1). doi:10.1186/s12302-016-0100-y. PMC 5250645. Retrieved 8 January 2019. ^ Dalton R (November 2008). "Modified genes spread to local maize". Nature. 456 (7219): 149. doi:10.1038/456149a. PMID 19005518. ^ Agapito-Tenfen S, Lopez FR, Mallah N, Abou-Slemayne G, Trtikova M, Nodari RO, Wickson F (November 2017). "Transgene flow in Mexican maize revisited: Socio-biological analysis across two contrasting farmer communities and seed management systems". Ecology and Evolution. 7 (22): 9461–9472. doi:10.1002/ece3.3415. PMC 5696427. PMID 29187982. ^ Keese, Paul (2008). "Risks from GMOs due to Horizontal Gene Transfer". Environmental Biosafety Research. 7 (3): 123–149. doi:10.1051/ebr:2008014. ISSN 1635-7922. ^ "FDA: Genetically engineered fish would not harm nature". USA Today. 2012. Retrieved 28 November 2015. ^ Medicine, Center for Veterinary. "Animals with Intentional Genomic Alterations - AquAdvantage Salmon Fact Sheet". www.fda.gov. Retrieved 6 February 2019. ^ "Containing Genetically Modified Bacteria". National Institutes of Health (NIH). 9 November 2015. Retrieved 12 September 2018. ^ Lombardo L (October 2014). "Genetic use restriction technologies: a review". Plant Biotechnology Journal. 12 (8): 995–1005. doi:10.1111/pbi.12242. PMID 25185773. ^ Carpenter, Janet E. (2011). "Impact of GM crops on biodiversity". GM crops. 2 (1): 7–23. doi:10.4161/gmcr.2.1.15086. ISSN 1938-2006. PMID 21844695. ^ Tabashnik BE, Brévault T, Carrière Y (June 2013). "Insect resistance to Bt crops: lessons from the first billion acres". Nature Biotechnology. 31 (6): 510–21. doi:10.1038/nbt.2597. PMID 23752438. ^ Qiu J (13 May 2010). "GM crop use makes minor pests major problem". Nature News. doi:10.1038/news.2010.242. ^ "Report in Brief – Genetically Engineered Crops". National Academy of Sciences. Retrieved 14 February 2019. ^ Waltz E (September 2009). "GM crops: Battlefield". Nature. 461 (7260): 27–32. doi:10.1038/461027a. PMID 19727179. ^ Sparrow R, Cohen G (2015). "Genetically engineering humans: a step too far?". Pharmaceutical Journal. Retrieved 14 February 2019. ^ Hamzelou, Jessica. "Human genome editing shouldn't be used for enhancement – yet". New Scientist. Retrieved 14 February 2019. ^ Paull J (2015). "GMOs and organic agriculture: Six lessons from Australia". Agriculture & Forestry. 61 (1): 7–14. doi:10.17707/AgricultForest.61.1.01. ^ "GMOs Are Safe, But Don't Always Deliver On Promises, Top Scientists Say". NPR.org. Retrieved 14 February 2019. ^ Landrigan PJ, Benbrook C (August 2015). "GMOs, Herbicides, and Public Health". The New England Journal of Medicine. 373 (8): 693–5. doi:10.1056/NEJMp1505660. PMID 26287848. ^ Zhou, Wen (10 August 2015). "The Patent Landscape of Genetically Modified Organisms". Science in the News. Retrieved 5 May 2017. ^ Lucht, Jan M. (30 July 2015). "Public Acceptance of Plant Biotechnology and GM Crops". Viruses. 7 (8): 4254–4281. doi:10.3390/v7082819. ISSN 1999-4915. PMC 4576180. PMID 26264020. ^ Stapleton, Patricia A. (2016). "From Mad Cows to GMOs: The Side Effects of Modernization". European Journal of Risk Regulation. 7 (03): 517–531. doi:10.1017/S1867299X0000605X. ISSN 1867-299X. ^ Paarlberg, Robert (6 November 2014). "A dubious success: The NGO campaign against GMOs". GM Crops & Food. 5 (3): 223–228. doi:10.4161/21645698.2014.952204. ISSN 2164-5698. PMC 5033189. PMID 25437241. ^ Johnson N (8 July 2013). "The genetically modified food debate: Where do we begin?". Grist. ^ Kloor K (22 August 2014). "On Double Standards and the Union of Concerned Scientists". Discover Magazine's CollideAScape. ^ Marden E. "Risk and Regulation: U.S. Regulatory Policy on Genetically Modified Food and Agriculture". 44 B.C.L. Rev. 733 (2003). By the late 1990s, public awareness of GM foods reached a critical level and a number of public interest groups emerged to focus on the issue. One of the early groups to focus on the issue was Mothers for Natural Law ("MFNL"), an Iowa based organization that aimed to ban GM foods from the market.... The Union of Concerned Scientists ("UCS"), an alliance of 50,000 citizens and scientists, has been another prominent voice on the issue.... As the pace of GM products entering the market increased in the 1990s, UCS became a vocal critic of what it saw as the agency’s collusion with industry and failure to fully take account of allergenicity and other safety issues. ^ Knight, Andrew J. (14 April 2016). Science, Risk, and Policy. Routledge. p. 156. ISBN 978-1317280811. ^ "Genetically modified food and health: A second interim statement" (PDF). British Medical Association Board of Science and Education. March 2004. ^ "Genetically Modified Foods" (PDF). Public Health Association of Australia. 2007. Archived from the original (PDF) on 20 January 2014.